Note: This bangle measures 6 1/2 inches (2 1/3 inches diameter). 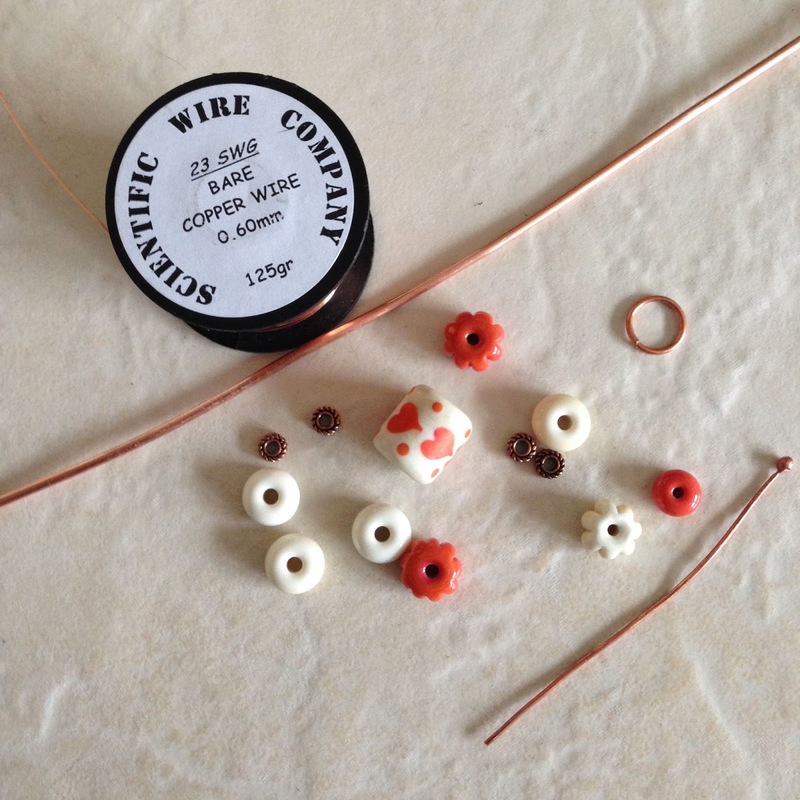 You will need to adjust your wire requirements for the finished size you require and to take into account the size of the beads you use. 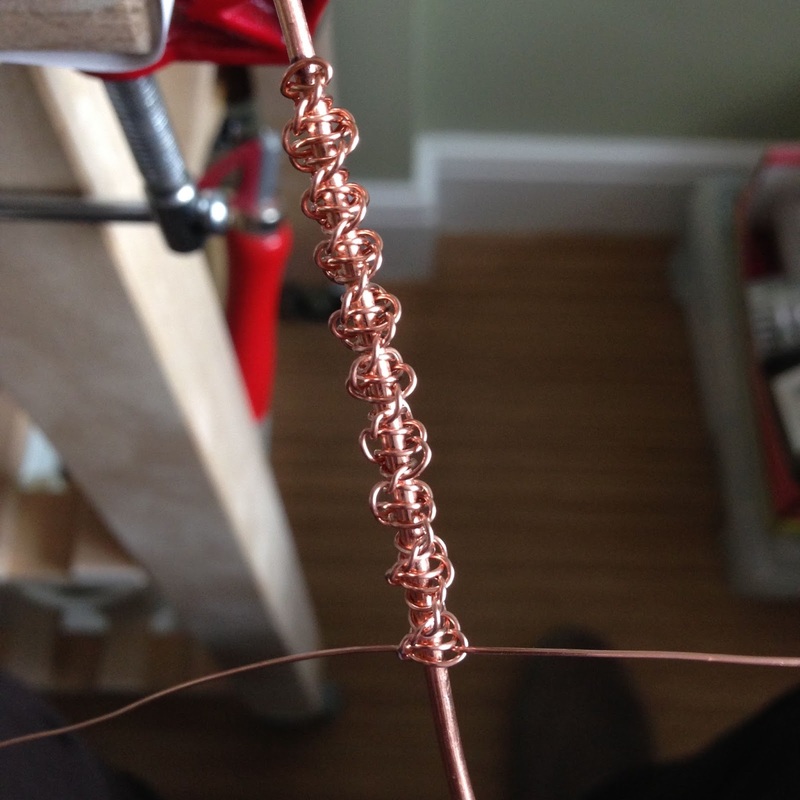 Cut an 8 ½ inch length of 2mm copper wire. 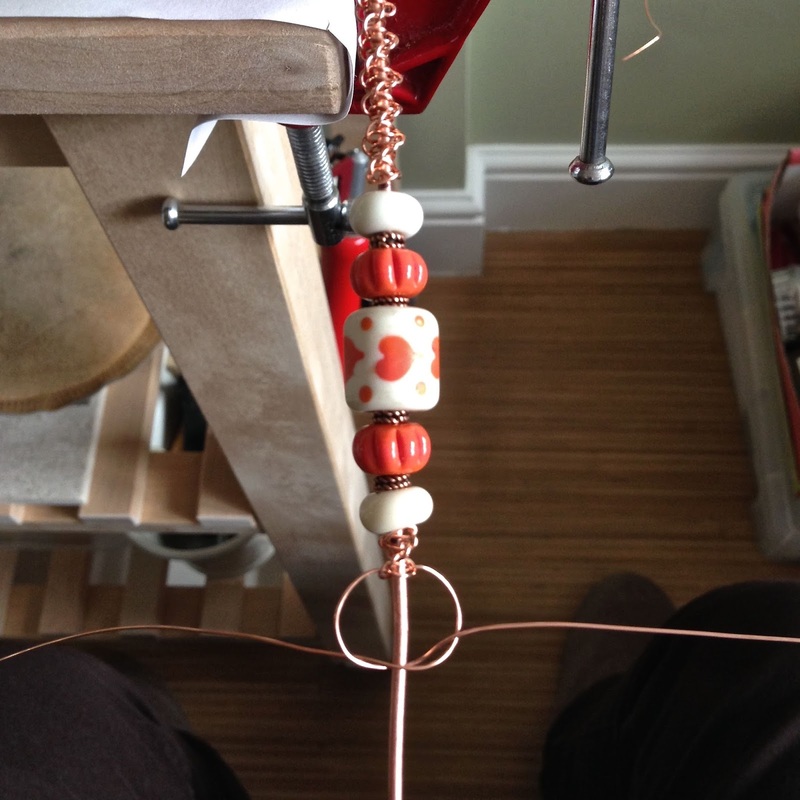 Add the focal beads, centre on the wire and mark the position with a sharpie. 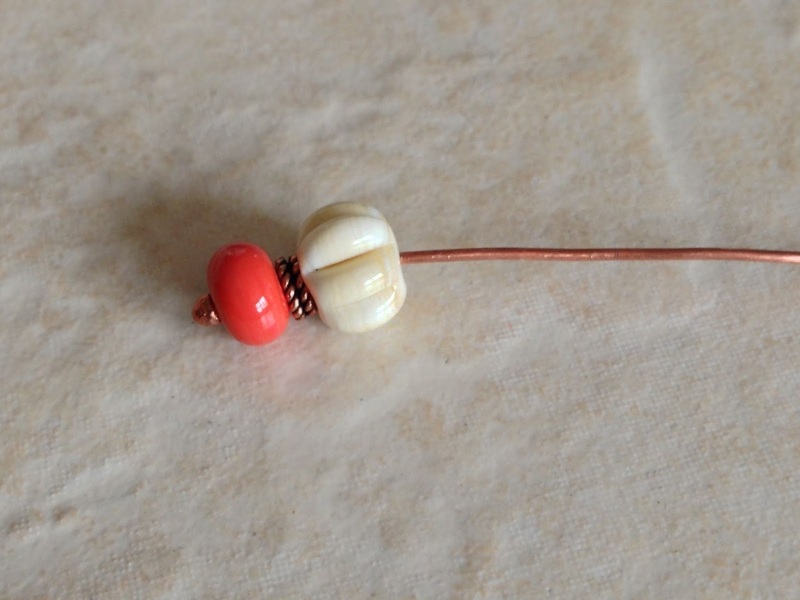 Remove the beads and secure one end of the wire in a bench vice. Cut 2 3ft lengths of 0.60mm copper wire. 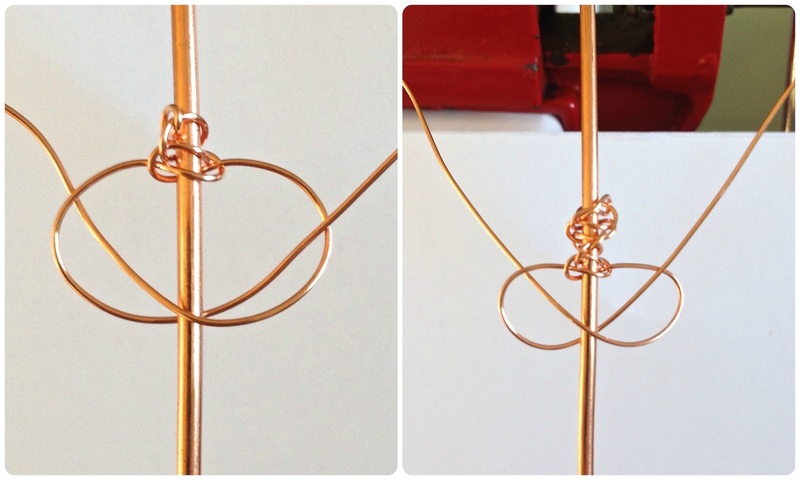 With one length and working from a mark out towards the end of the core work a macrame half square knot spiral pattern until 1 ½ inches of the core wire remains. Use 2 pairs of pliers to pull the wire taught. Instruction for a macrame half square knot can be found here. Remove from the vice, wrap one of the wire tails around the core 3 times and trim. wrap the second tail it over the first and trim. 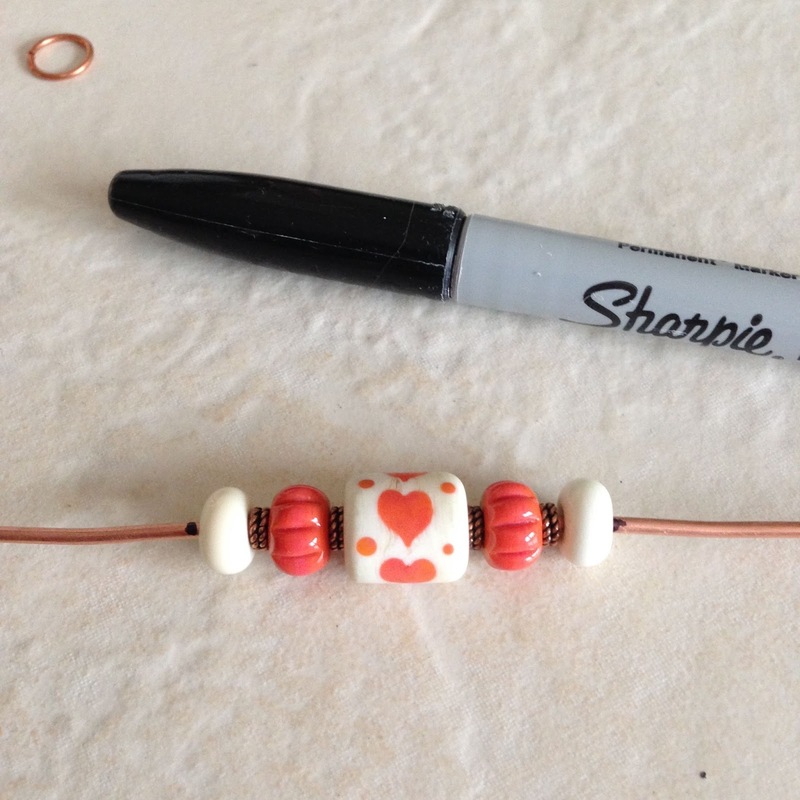 Add a bead to each end of the core wire and turn a simple loop. 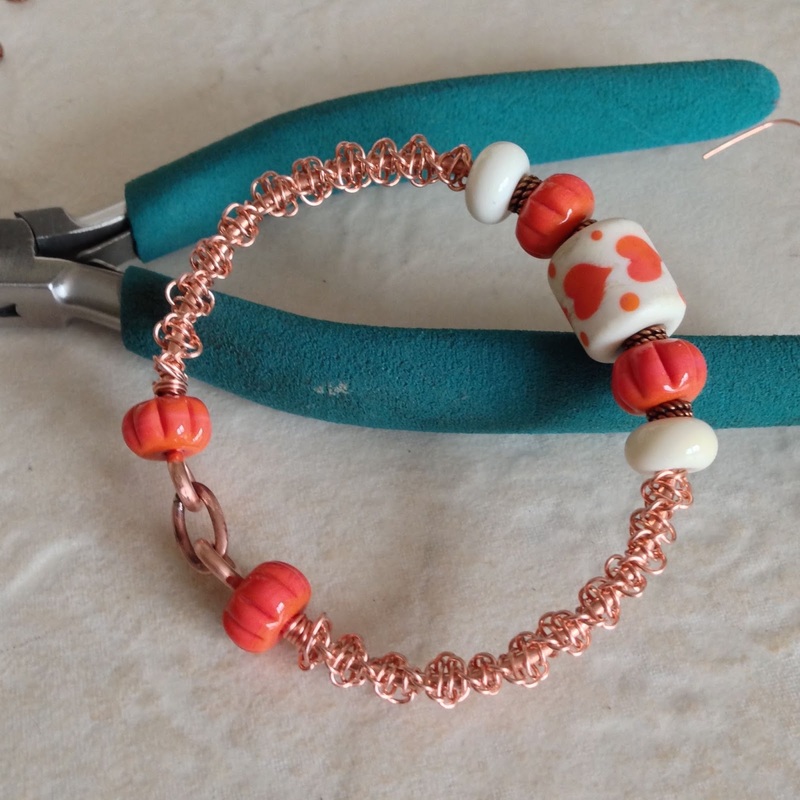 Take a 10mm copper jump ring and place it over the close tips of a pair of round noses pliers. Open the pliers to make an oval jump ring. 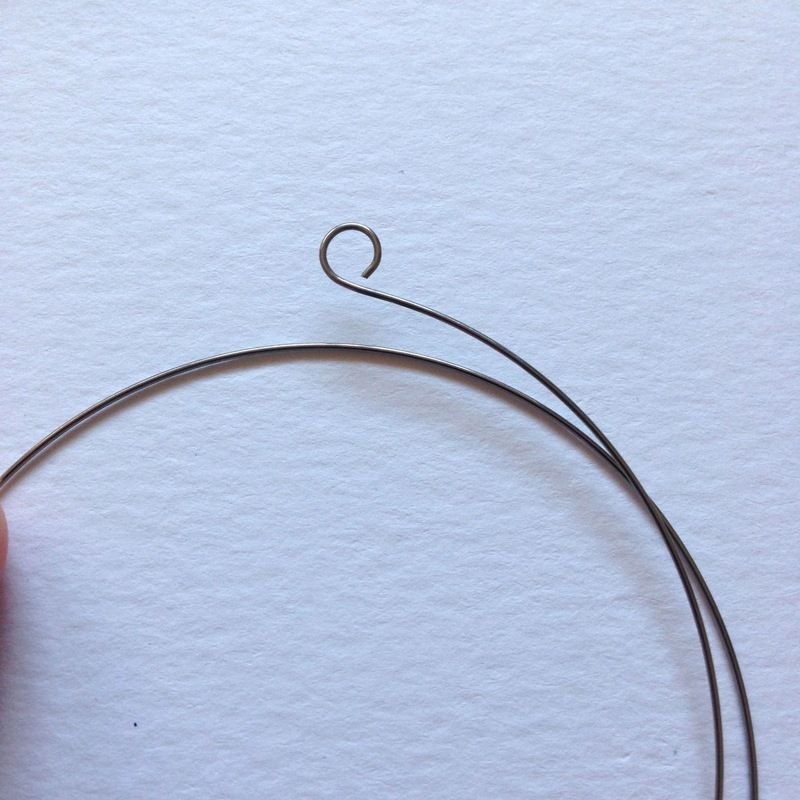 Gently shape the bangle over a mandrel then open the loops one at a time, attach the jump ring and close the loops. 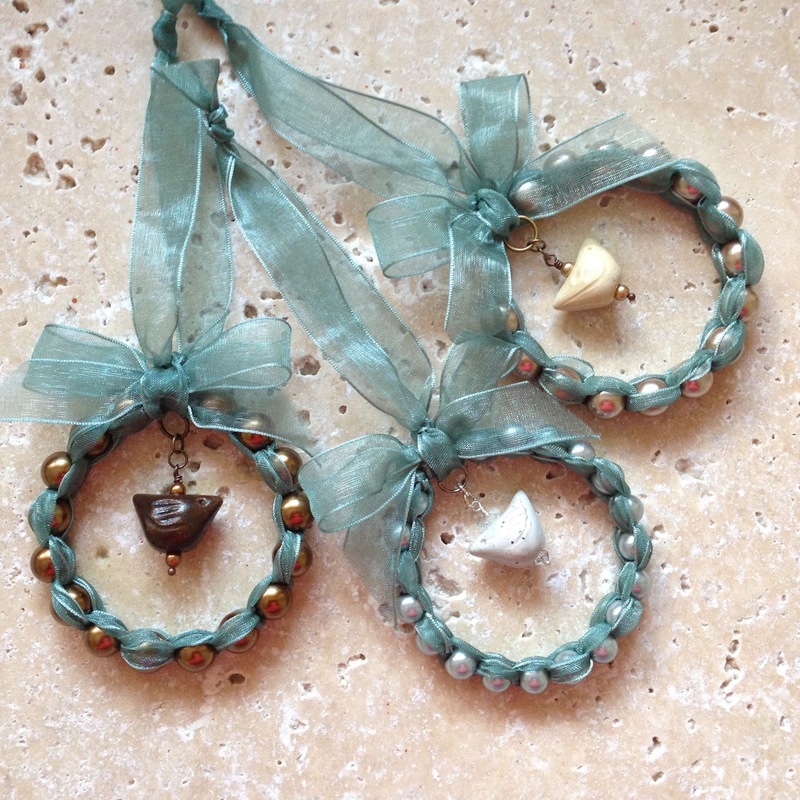 Make a beaded dangle and wire wrap to attach to the oval jump ring. Use Liver of sulphur to patinate, polish back to your preferred finish and tumble if desired. I hope you enjoyed this tutorial and if you give it a go don’t forget to share your makes with us on the AJE Facebook page. 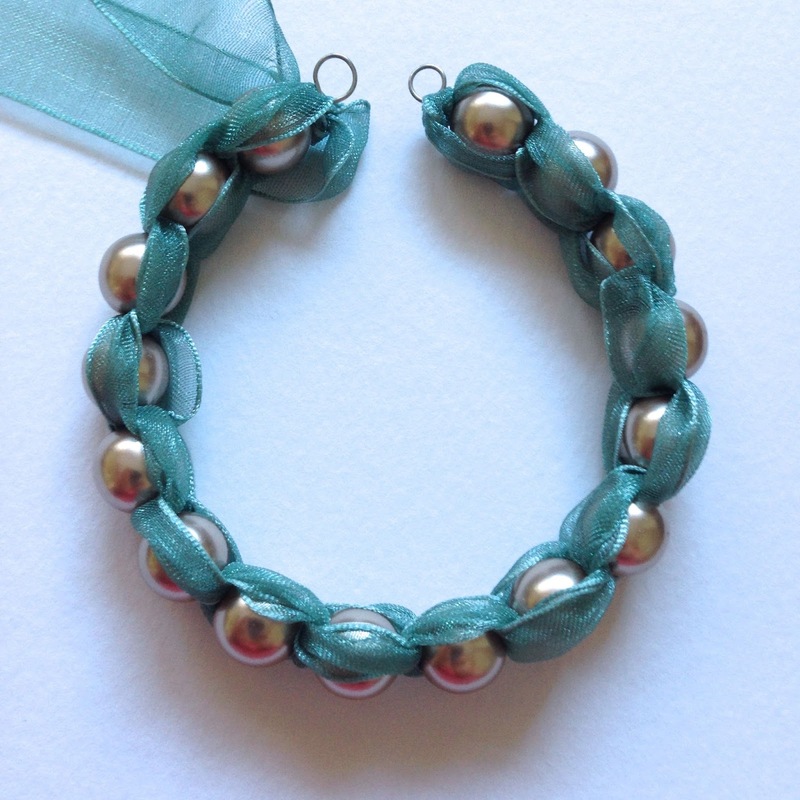 Today I’m sharing with you a tutorial for a beaded wreath Christmas ornament that I devised by adapting my design for a silk macrame bangle – please excuse the fact that it’s displayed on a laurel bush but my Christmas tree is not up yet. 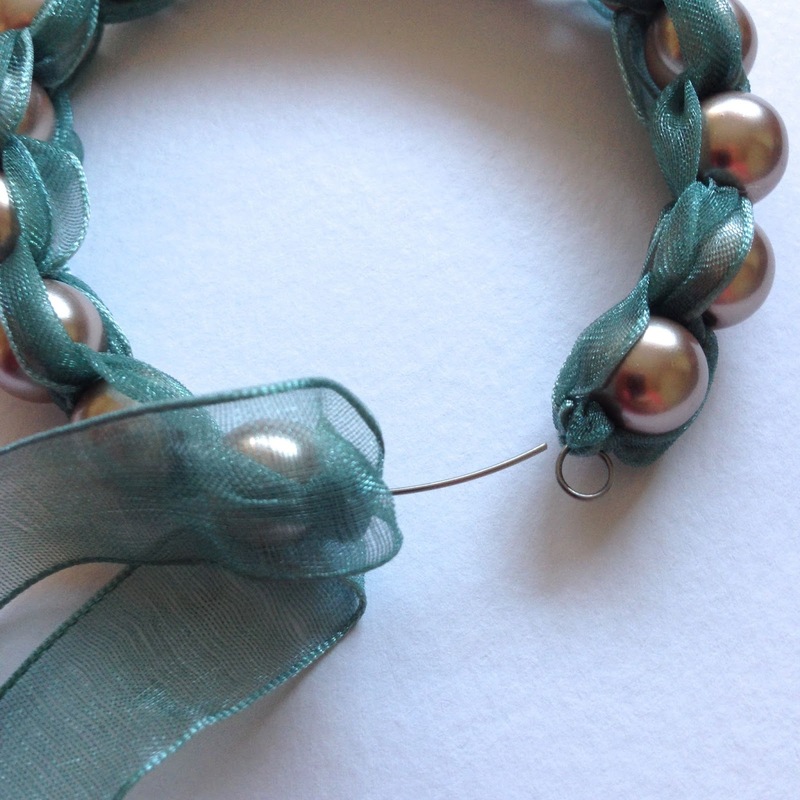 For this ornament I’ve used 15mm organza ribbon and 10mm glass pearls but you can literally use anything you like to create an ornament that suits your own decor…ribbons, cord and even fancy knitting yarn can all be combined with fun and funky results…just let your imagination run wild. This design is worked with a simple macrame square knot but the nature of the ribbon I used makes it a little tricky to see the technique so if you need clarification you can find a diagram here. With the round nosed pliers turn a loop at one end of the memory wire. 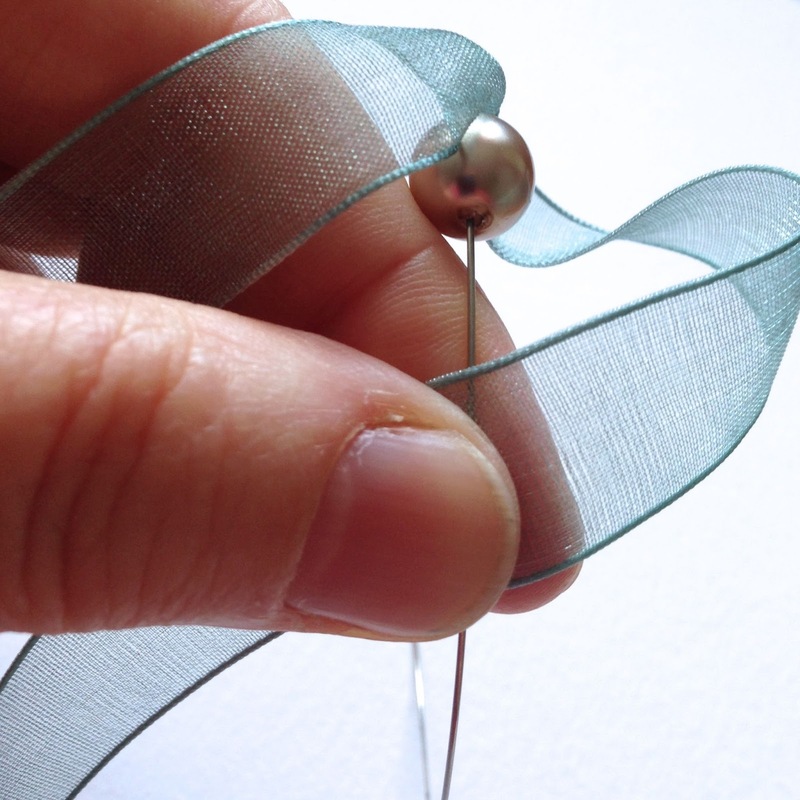 Take the 48″ length of ribbon, find the centre and tie it around the memory wire adjacent to the loop. 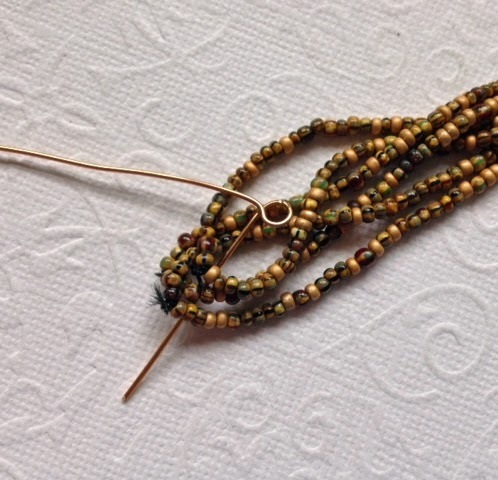 Thread a bead onto the wire. 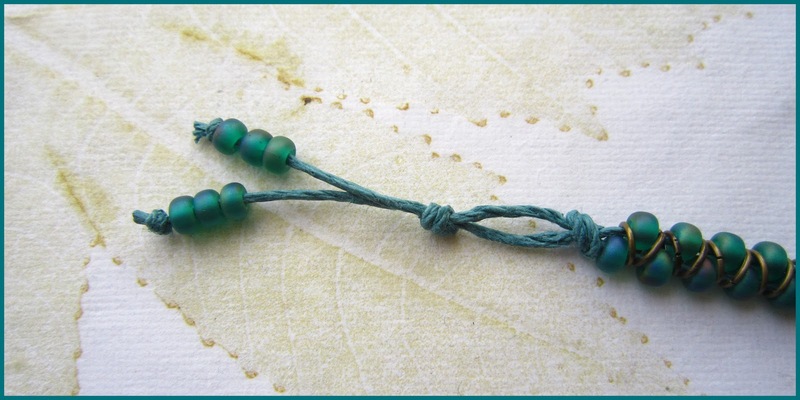 Create the first part of a simple macrame square knot by taking the right hand ribbon and passing it over the memory wire which acts as your core. 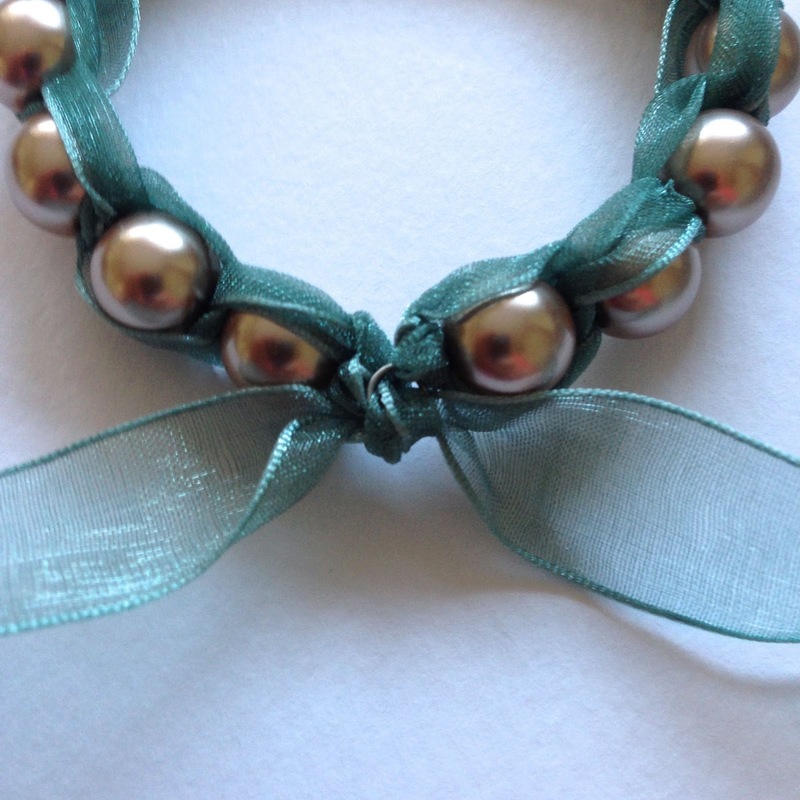 Then pass the left hand ribbon over the right hand ribbon and under the core wire and pull though to secure the bead. 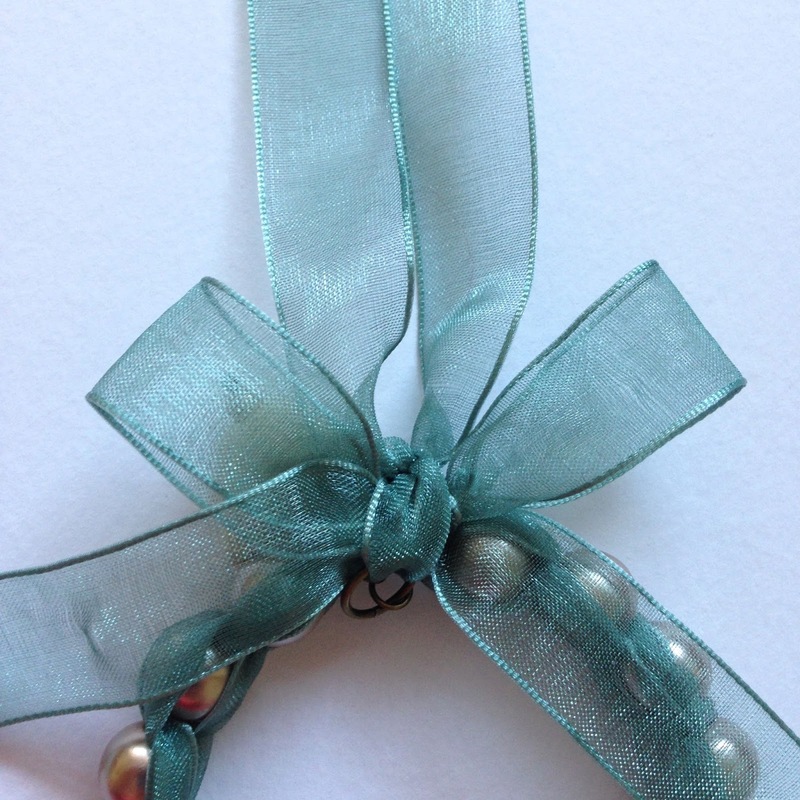 Don’t pull the ribbon too tight – you want to aim for it to drape nicely around the bead. Add another bead. Create the second part of the macrame square knot by taking the left hand ribbon and passing it over the memory wire then pass the right hand ribbon over the left hand ribbon and under the core wire and pull though to secure the bead ( the reverse of the process in step 4). Because memory wire is springy this process can feel a little awkward at first but once you have a few beads in situ it becomes easier. I found I got more control by tucking the free end of the wire under my little finger. 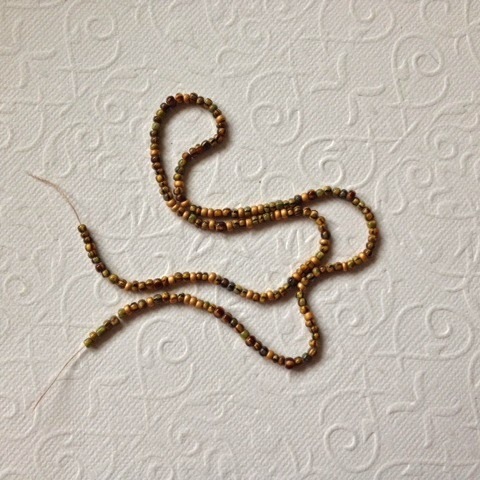 Repeat steps 3 – 5 until all the beads are threaded and the circle is completed. 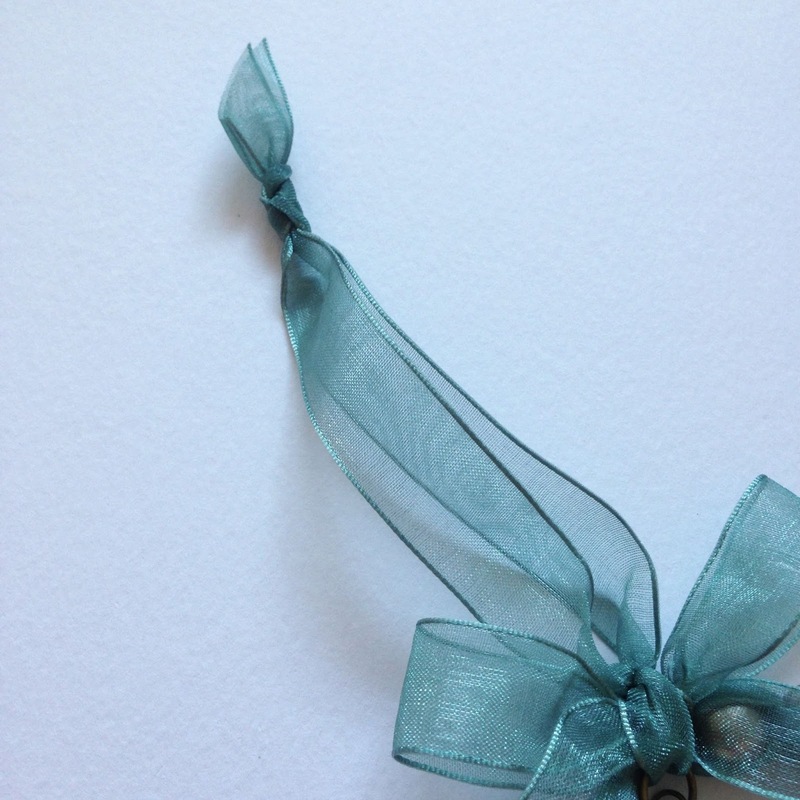 Tie an overhand knot to secure the ribbon. 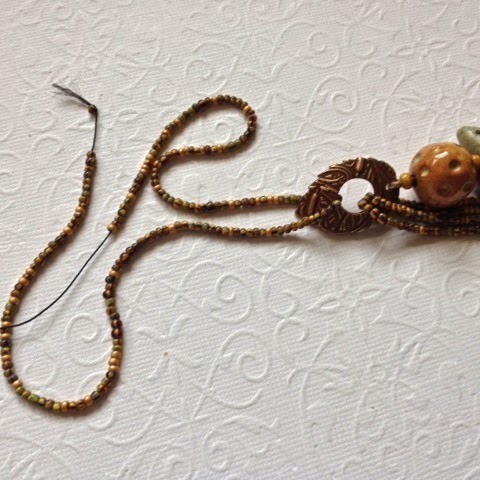 Make sure the beads are snug up to the first loop then trim the spare end of the memory wire and turn a second loop. Thread one of the ribbons tails through each of the loops pull together gently to close the wreathe then knot to secure. Wrap the tails around the loops a couple of times to hide them and then tie in a bow. 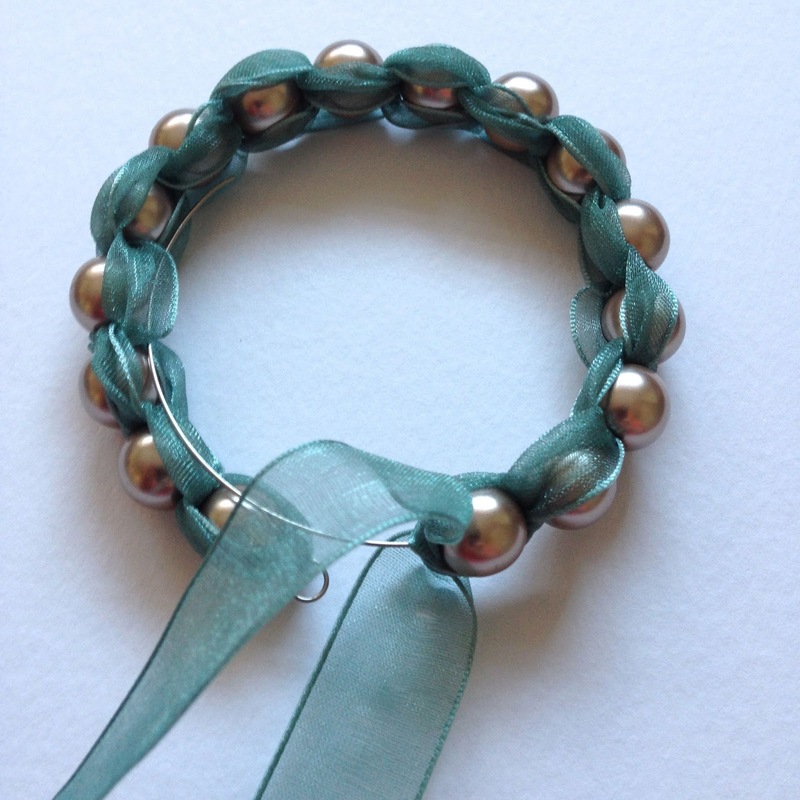 Attach your charm to the large jump ring then take the shorter length of ribbon and pass it through the jump ring. 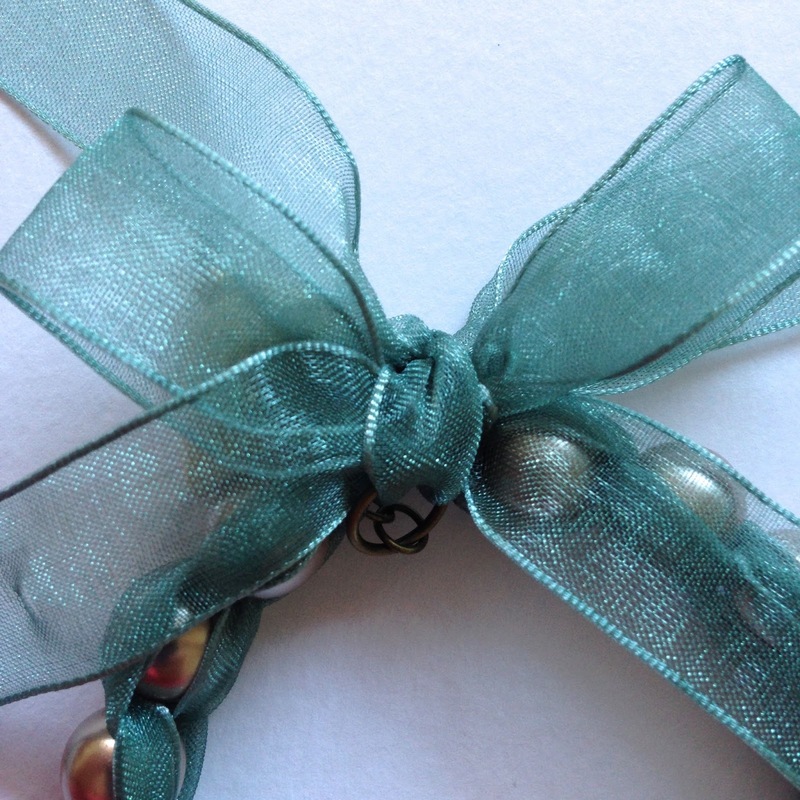 Place the ribbon and charm under the bow and bring it up around the front and back of the bow making sure to centre it carefully. 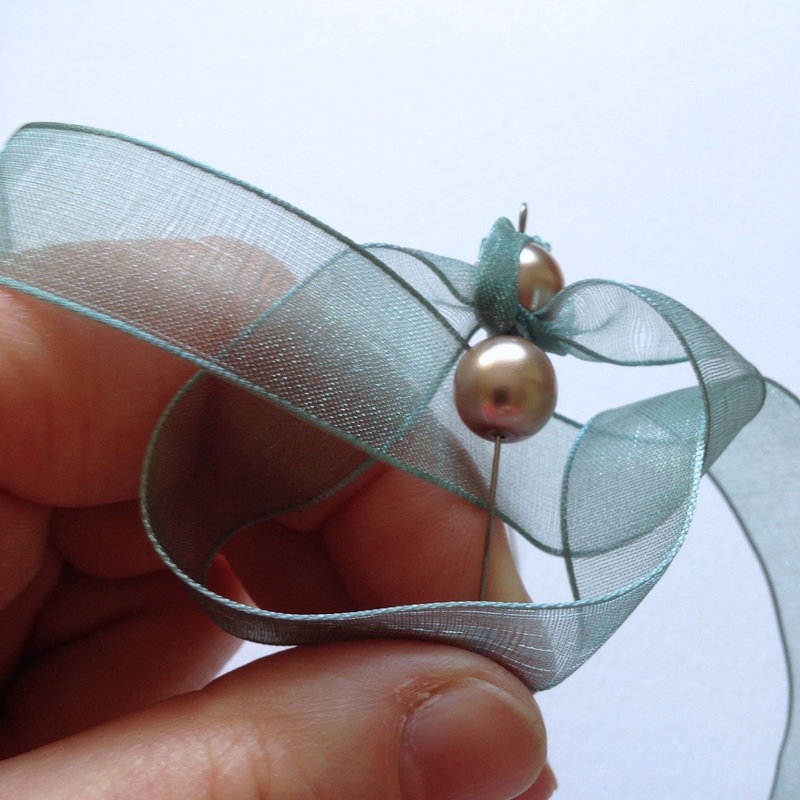 Knot the ribbon so that it creates a neat finish (not too tightly) to the bow and knot again to secure. 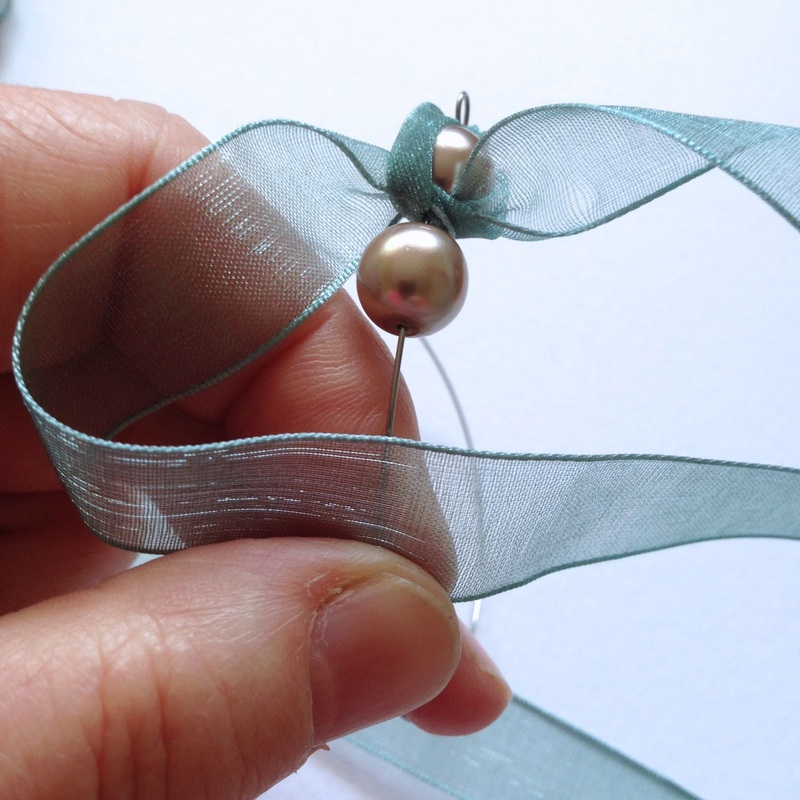 Tie the shorter ribbon at the ends to create a hanging loop. Trim the tail ends of the bow and there you have your finished ornament. 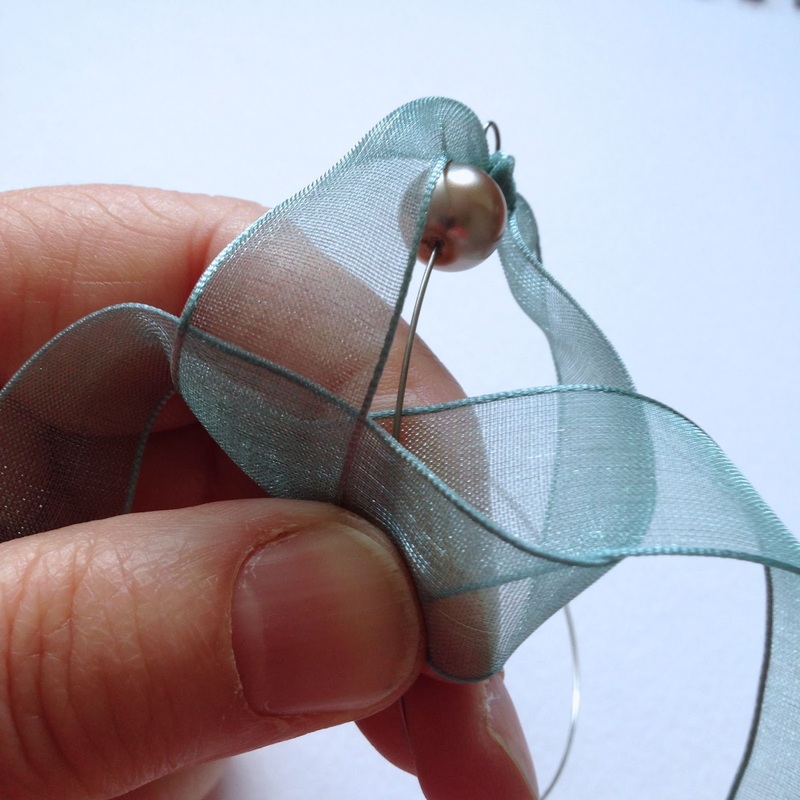 I hope you enjoyed the tutorial and are inspired to have a go at creating some ornaments of your own. 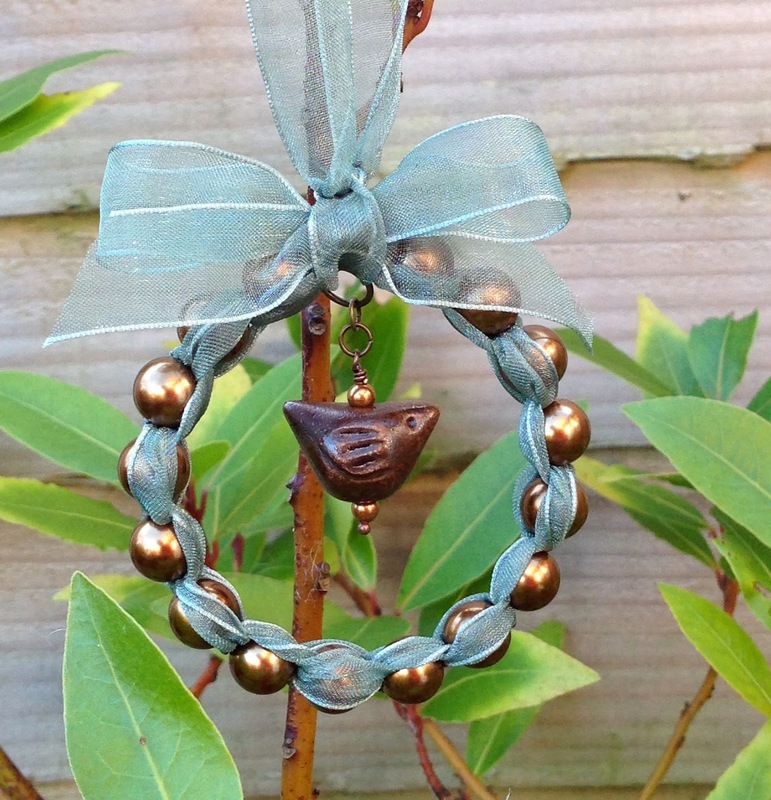 Birds are a perennial favourite with bead makers and buyers alike and this easy tutorial can be adapted to work with your own favourite examples. 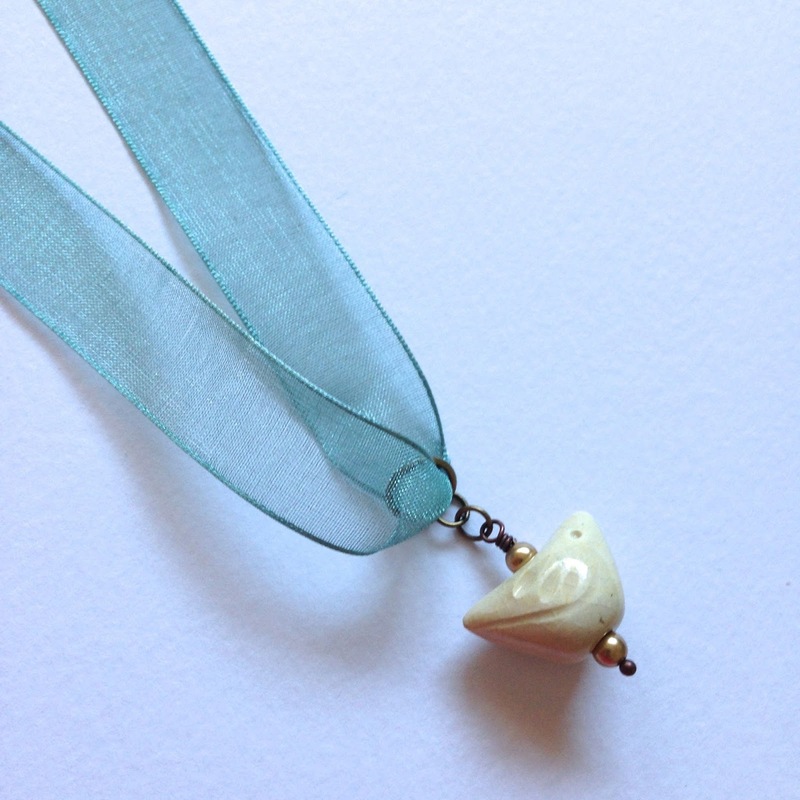 1 bird bead and wing(or similar) pendant. 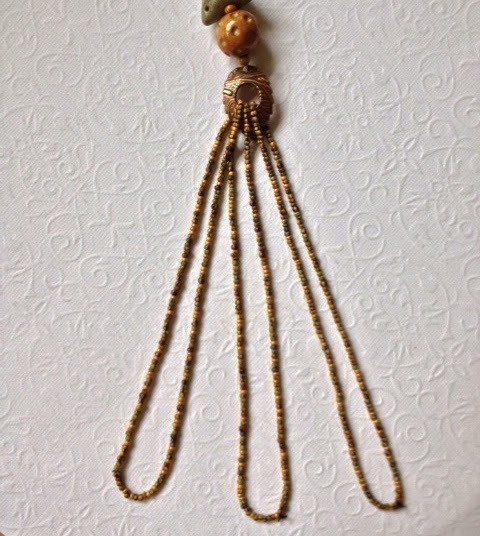 2 x 15″ lengths of chain with link large enough to thread a double strand of waxed linen through. 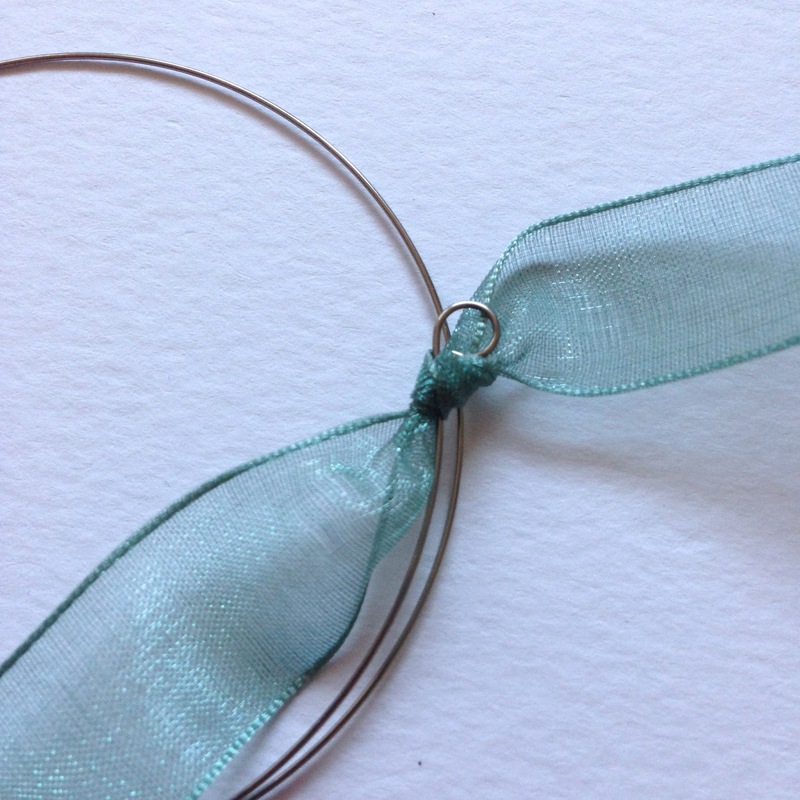 Using the wire and round nosed pliers create a wrapped loop to attach the wing pendant. 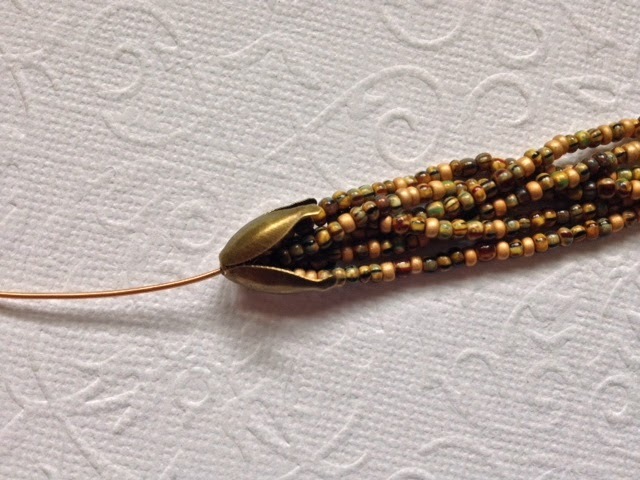 Pass the tail of the wire through the flat/curved/disc bead and the bird bead and make another wrapped loop to create a bail (add a seed bead to stabilise if required). Attach a length of chain to the bail either by opening a link in the chain or by adding a jump ring. Double up one length of waxed linen and attach it to the bail using a larks head knot. 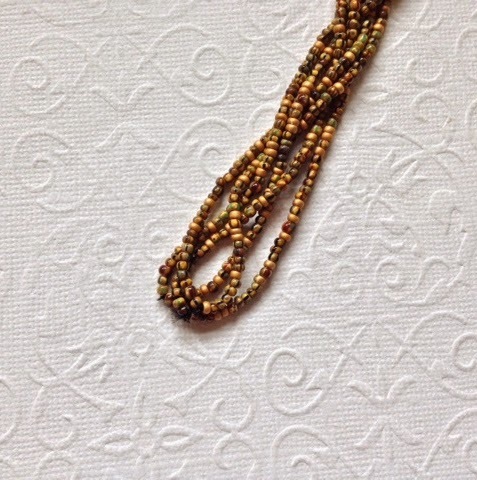 Thread a seed bead onto the double strand of linen and pass it through the second link of the chain. 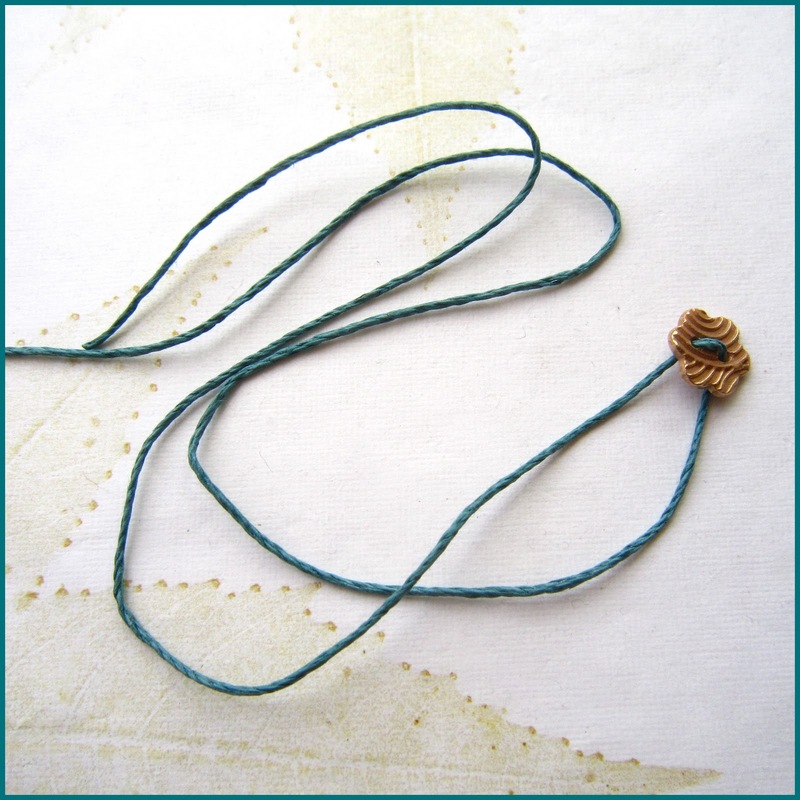 Add a second bead and pass the linen back through the chain skipping one link as you go. 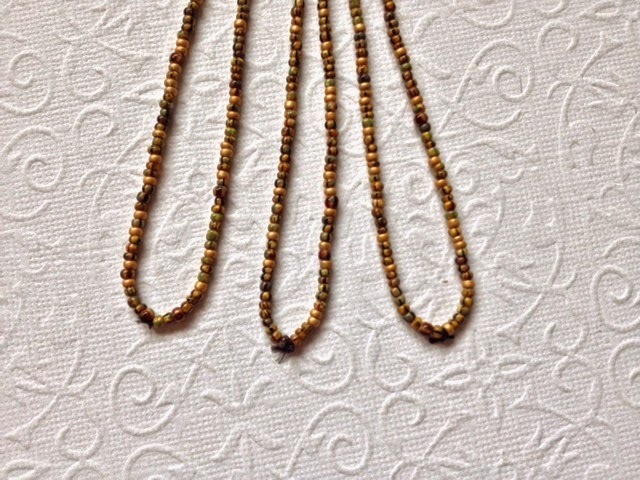 Continue adding seed beads and threading through alternate link of the chain until you get to the end. Check the tension of the linen and that the beads are evenly spaced. Add a final bead and tie of the linen to secure and then trim. 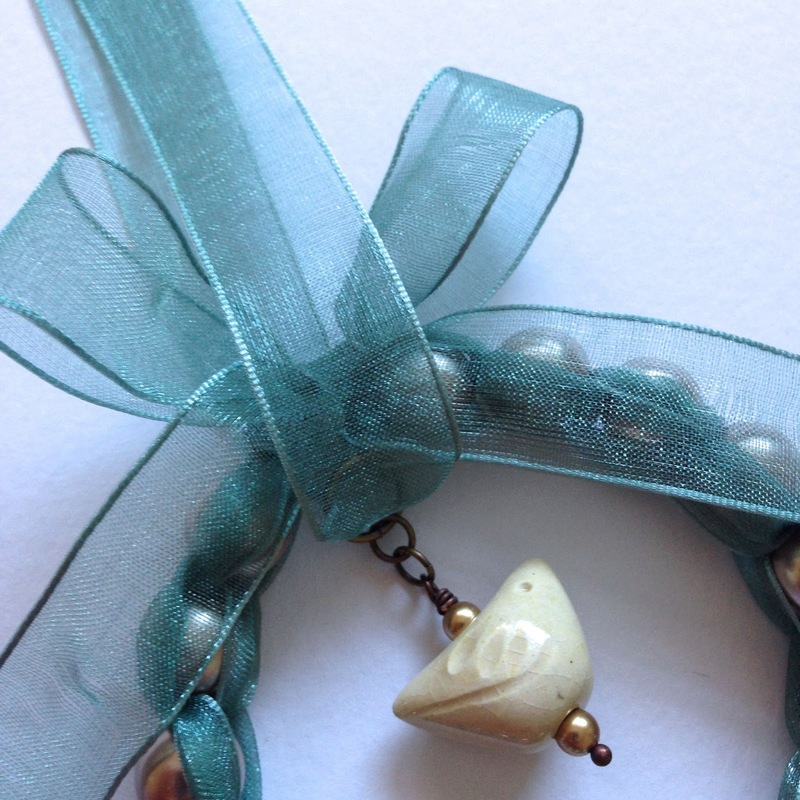 Repeat steps 3 – 7 on the other side of the bail to complete the necklace. 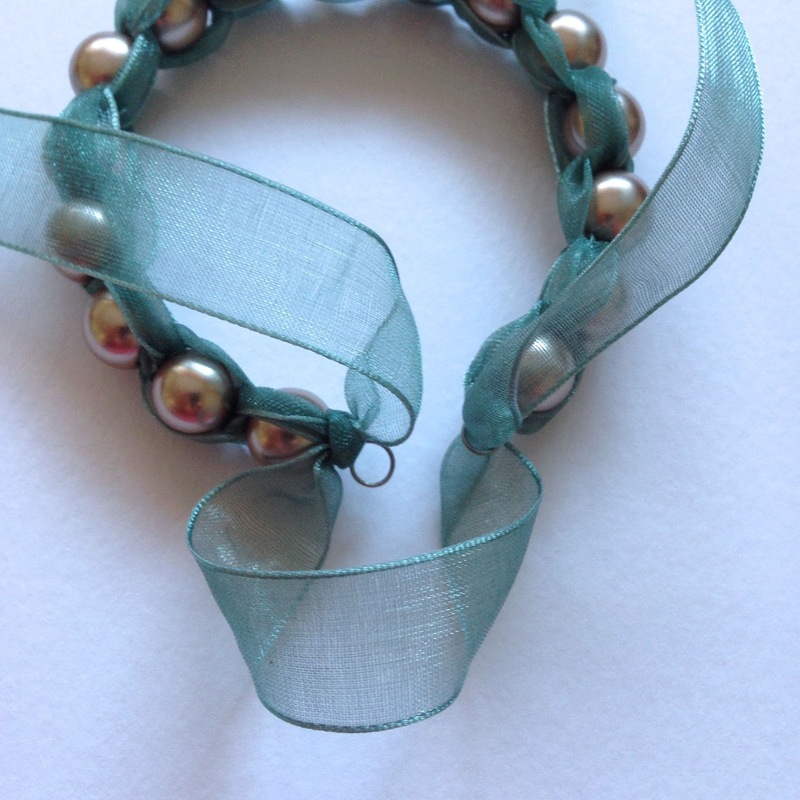 Add a clasp and jump ring. 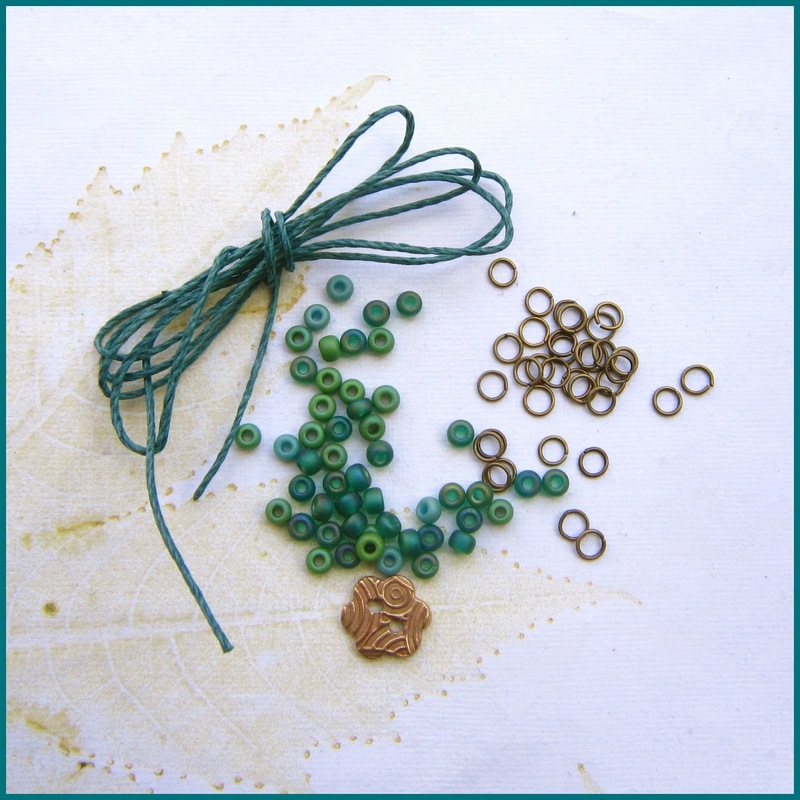 Use the headpins and seed beads to create charms with the Czech glass flowers if required. 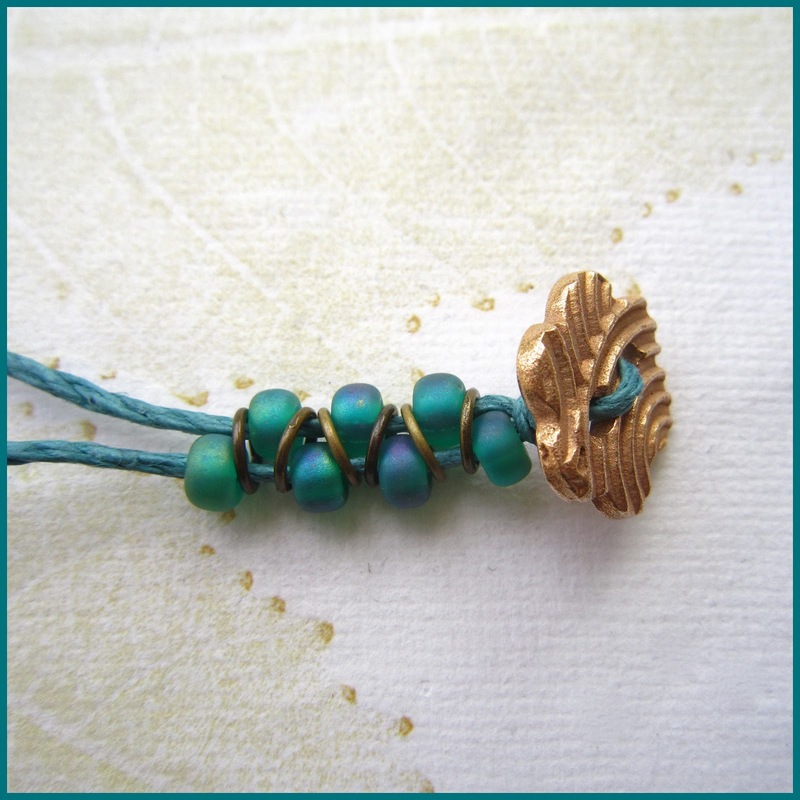 Using a jump ring attache the charms to the wrapped loop of the feather pendant. And that’s it – your necklace is fnished! 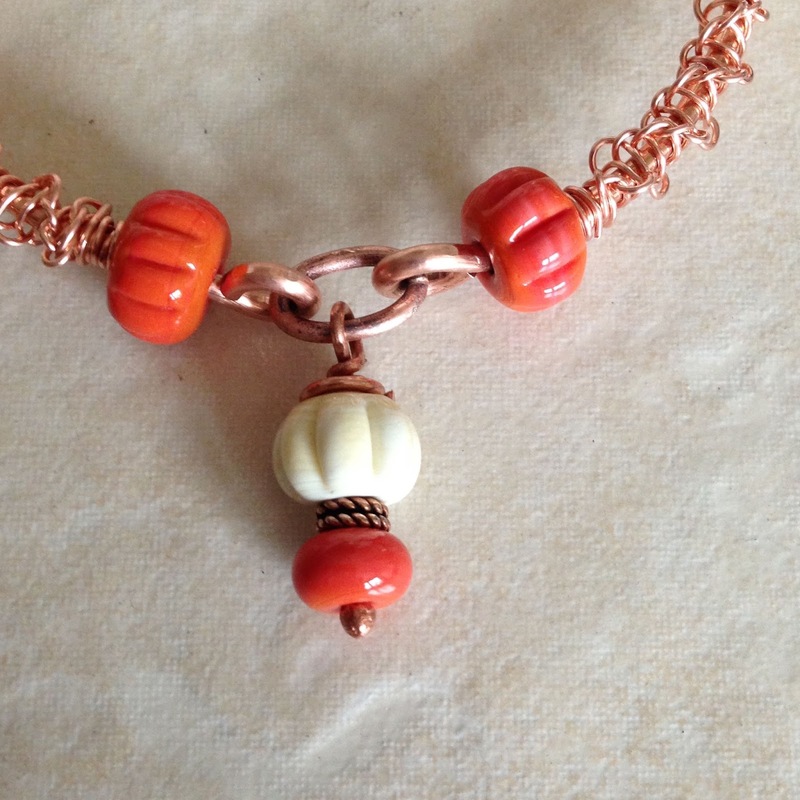 By changing up your beads and charms you can vary the effect you get with this design… Here’s another example of the design that was published in Jewelry Affaire in 2015. Hope you enjoyed the tutorial – happy creating. Check out my post on the Art Elements blog for more info on Dorset buttons. 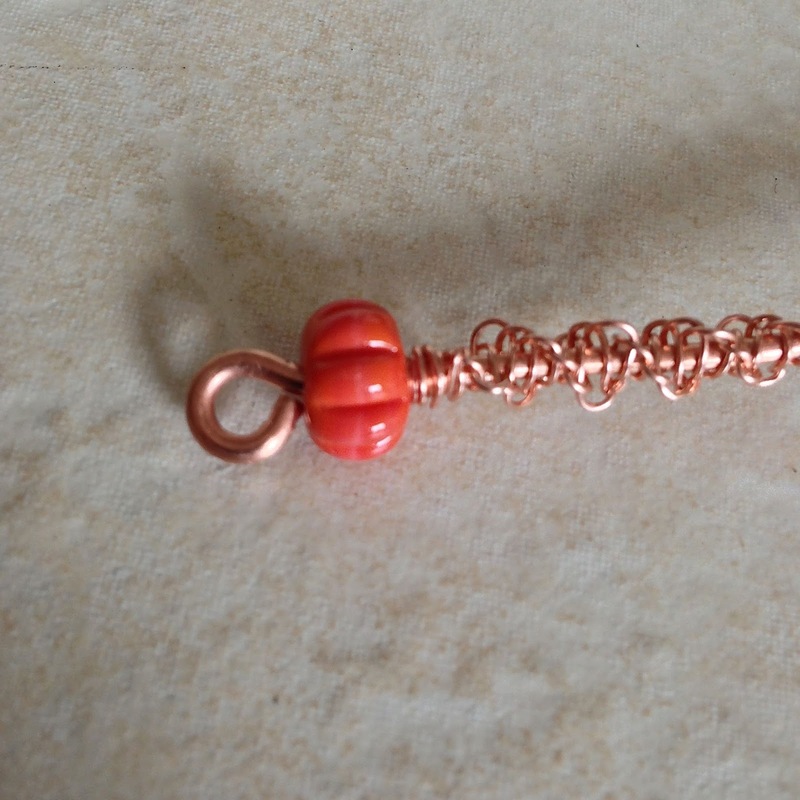 Take one piece of wire and wrap around your mandrel 10 times making sure it’s not too tight so that you can remove the wrapped piece from the mandrel and get it onto the leather. 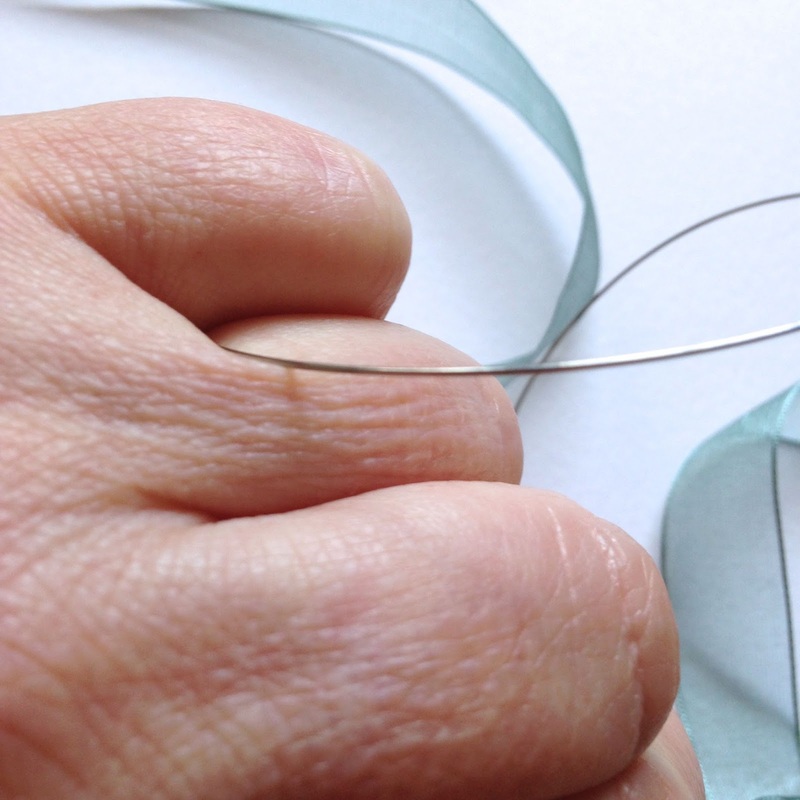 Using round nose pliers take the end of the wire and begin turning a coil in the wire. Transfer to flat nose pliers and continue coiling until you have 3 rings. Continue wrapping the wire around the mandrel until the coil is level with it. Press the coil flat against the wrapped wire as shown. Trim the tail end of the wire on the underside with the coil on top. Repeat steps 1 to 3 to create a second piece that mirrors the first. 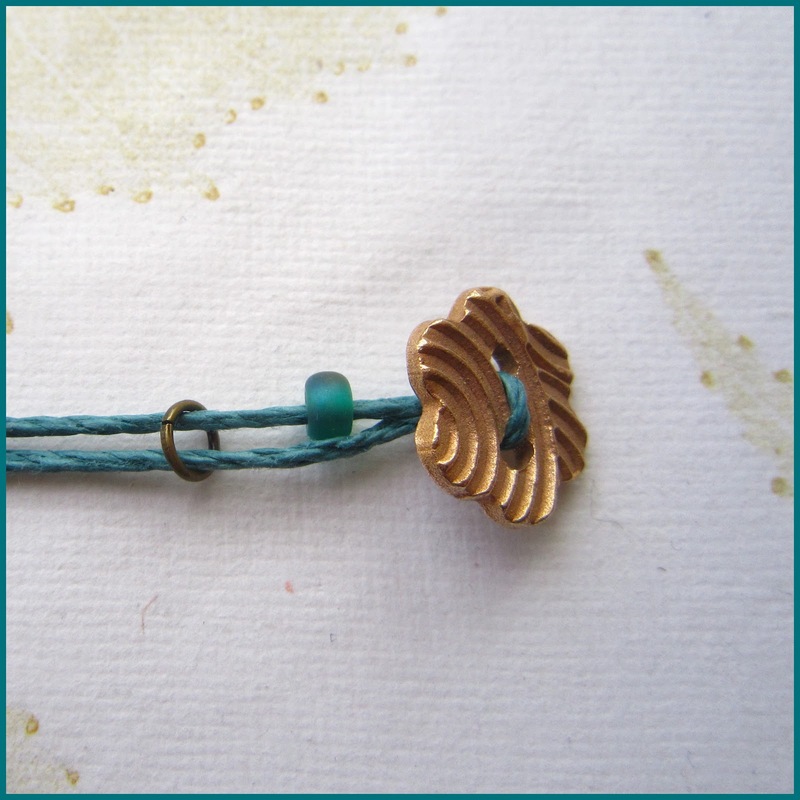 File or sand out any tool marks and use LOS to oxidise both pieces together with a jump ring if you’re using a charm. polish back with wire wool, tumble or polish. 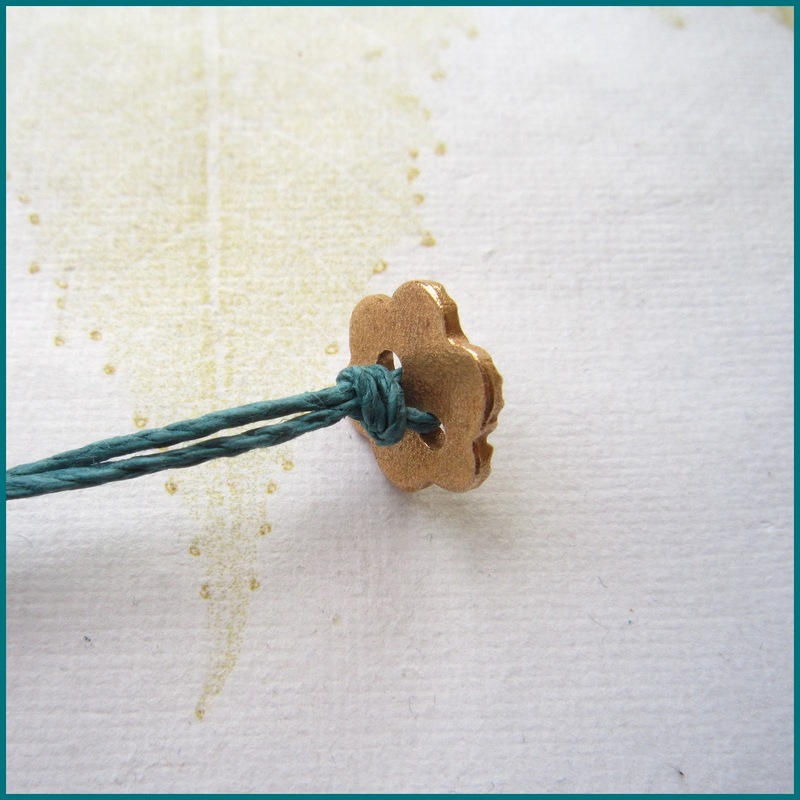 Thread the bead onto the leather and thread a copper element on either side. Make sure the focal element is centred then gently press the ends of the wires on the underside into the leather to stop any movement, taking care not to mar the leather on top. Use epoxy adhesive to glue the closure fittings onto the leather taking care to line the hook and eye up. Leave to dry. 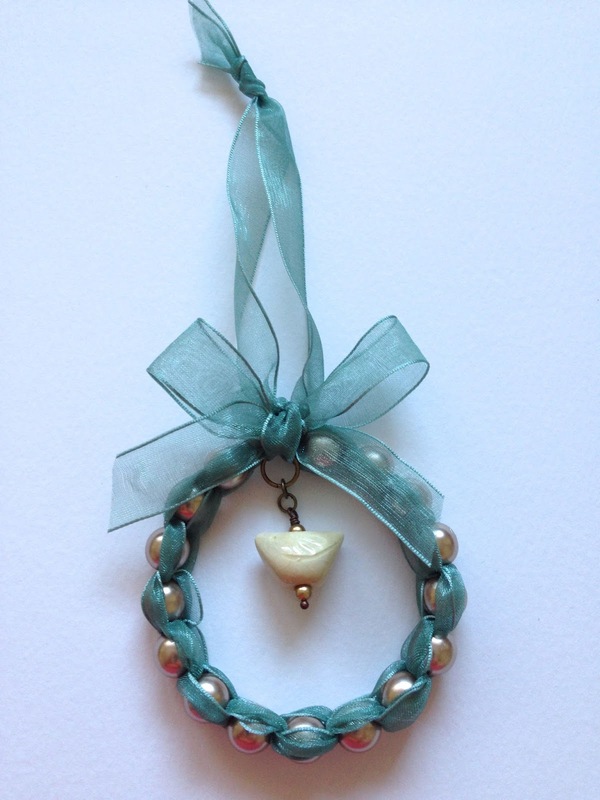 Use the jump ring to attach a charm to the eye section of the clasp. I’ve been wearing this since I finished it and it’s very comfortable. I really like it as it is but if you want to add a charm there are smaller versions available like these cute little shells. needle nose pliers, looping pliers or other round tool and a file. through the holes in the beads. You can find a tutorial for doing this here. looping pliers, mandrel or a round object like a sharpie marker. The loop should be visible above the top of the bead. meet while wrapping will help ensure the wire is snug. Trim the excess wire to 2 1/2 to 3 inches from the bead centre, file the end flat and remove any burrs. get to the bottom of the bead. loops at the bottom of the tendrils and file/polish out any tool marks. Repeat steps 1 to 8 to make the second earring and then use your pliers to gently adjust the coils to roughly match if necessary. Add your ear wires and treat with any desired patina and there you have your finished earrings! All the beads used in the earrings shown here are from Mermaid Glass. Hope you enjoyed this tutorial and feel inspired to try it yourself. 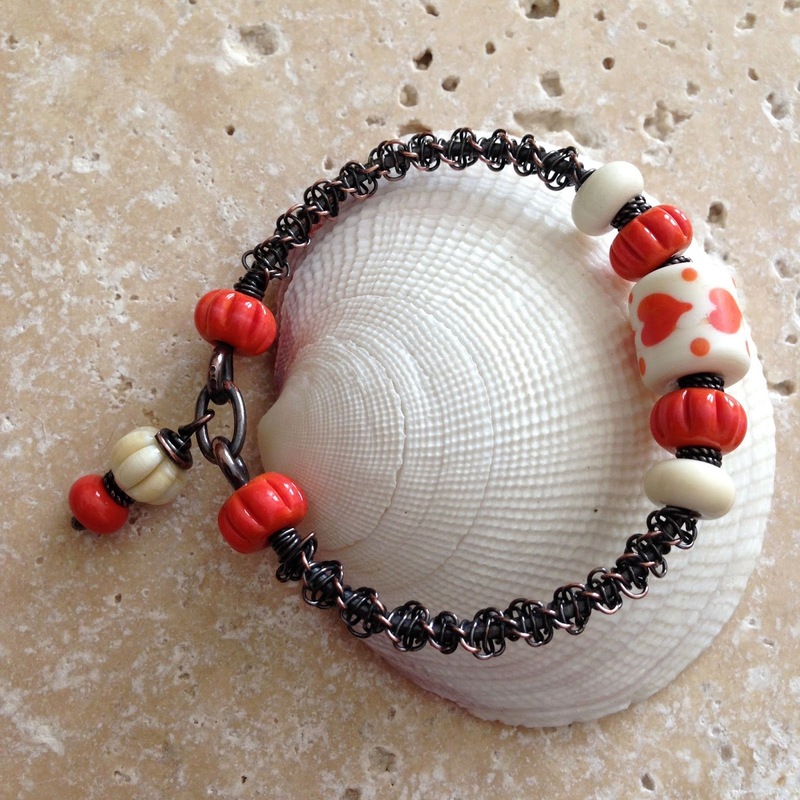 you own necklace and bracelet designs. 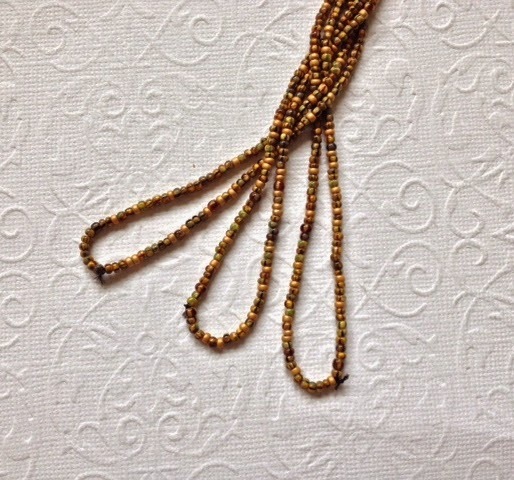 glass seed beads which came in hank of twelve 12 inch strands – approx. 18 beads per inch from Beads and Babble on Etsy. When your have your strands threaded pass one end through your decorative ring or connector. that the knots are at the opposite end for your rings/connectors. Whilst braiding make sure you keep your knots at the end of the loops. when you get to the end of the braid lay each strand on top of each other lining up the knots as closely as possible. 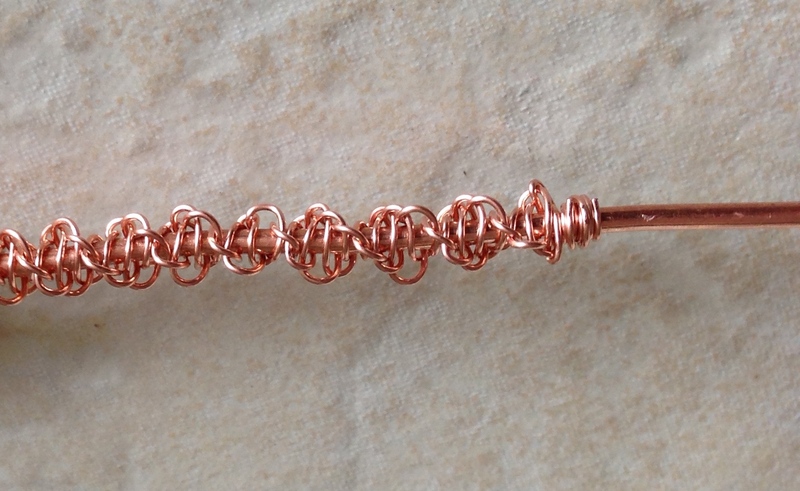 Take your wire and create a loop as you would if you were making a wrapped loop. when stringing your beads will help here. times to close it and trim the excess from the wrapped end of the wire. ensure the knots are enclosed and the strands are hanging correctly. 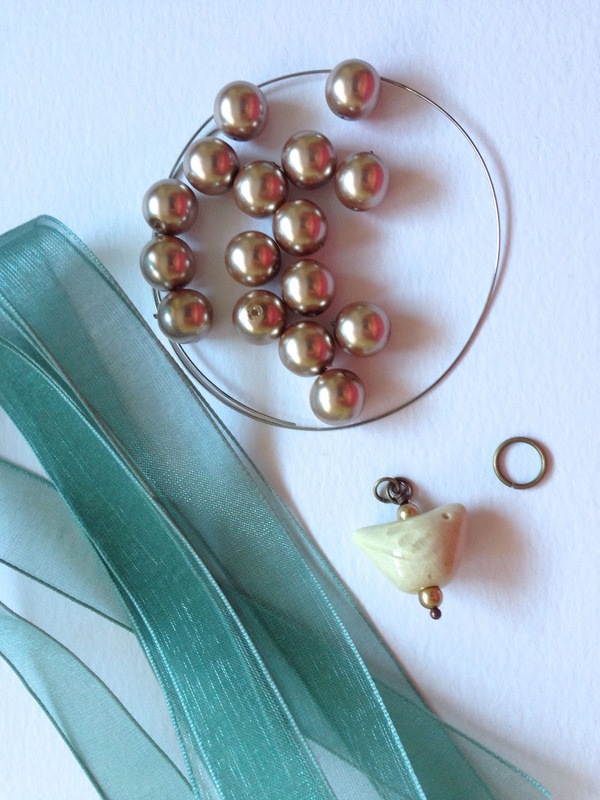 Create another wrapped loop with the wire extending from the bead cone/cap and adjust the cap to fit. Repeat steps 1 – 11 to create your second braided element and then add a clasp of your choice. And there you are – job done! 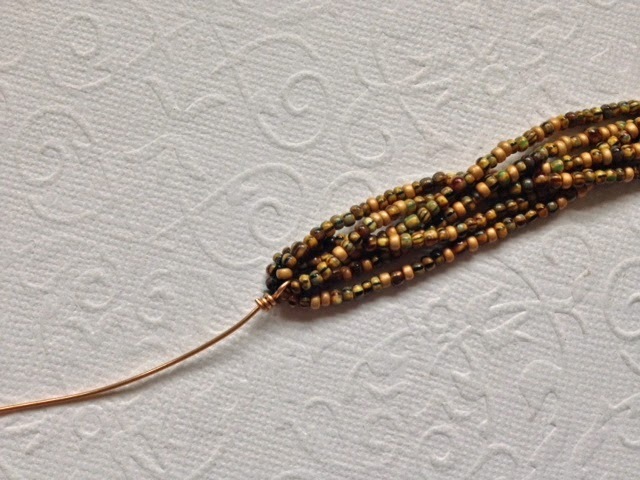 technique with bead cones/caps at both ends of the braid. I hope you enjoyed this tutorial and I look forward to seeing it in some of your designs. length of the wire according to the gauge used. 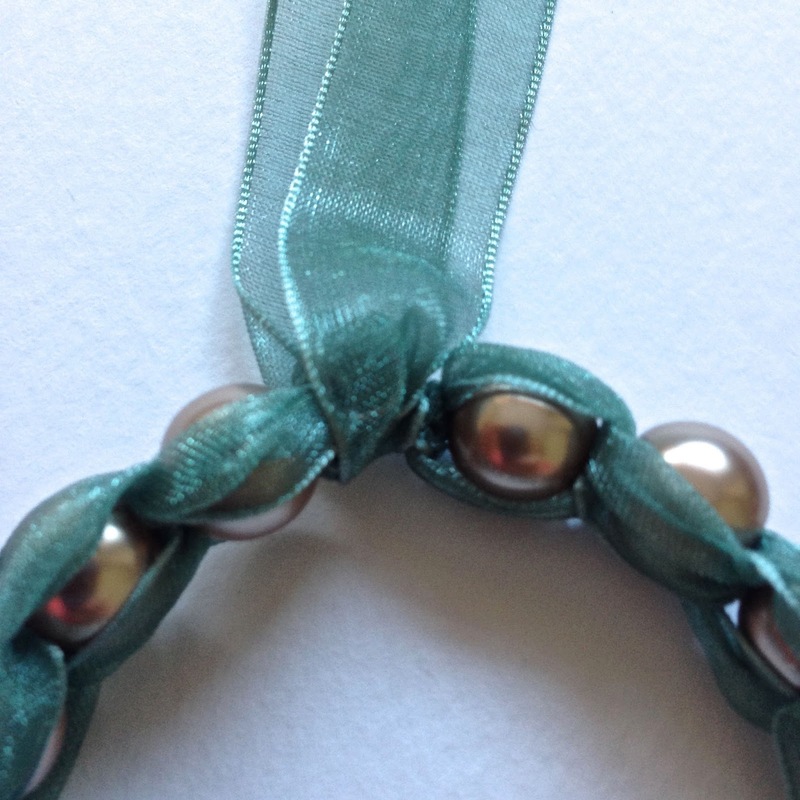 The basic knotting technique can also be found here. forget to cut extra wire if you do the latter. very sore fingers the next day – I know I tried! Repeat step 2 taking care to pass the wire in the same direction as this will create the spiral pattern. sharp edges. This will form the top of the earring. At the other end add your focal bead, trim and file the wire and turn another simple loop or warp a loop if preferred. 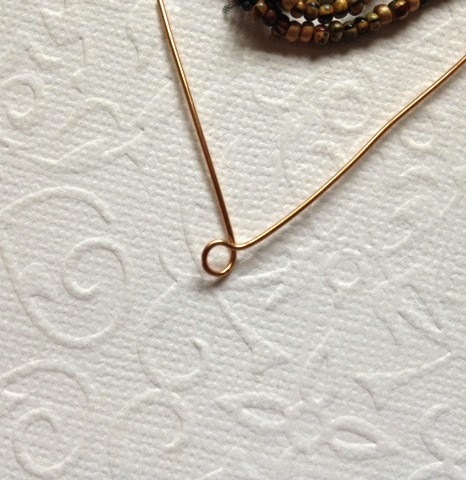 Add a headpin to an accent bead and turn a simple loop to create a dangle then add this to the bottom of your earring. Add an earwire of your choice. 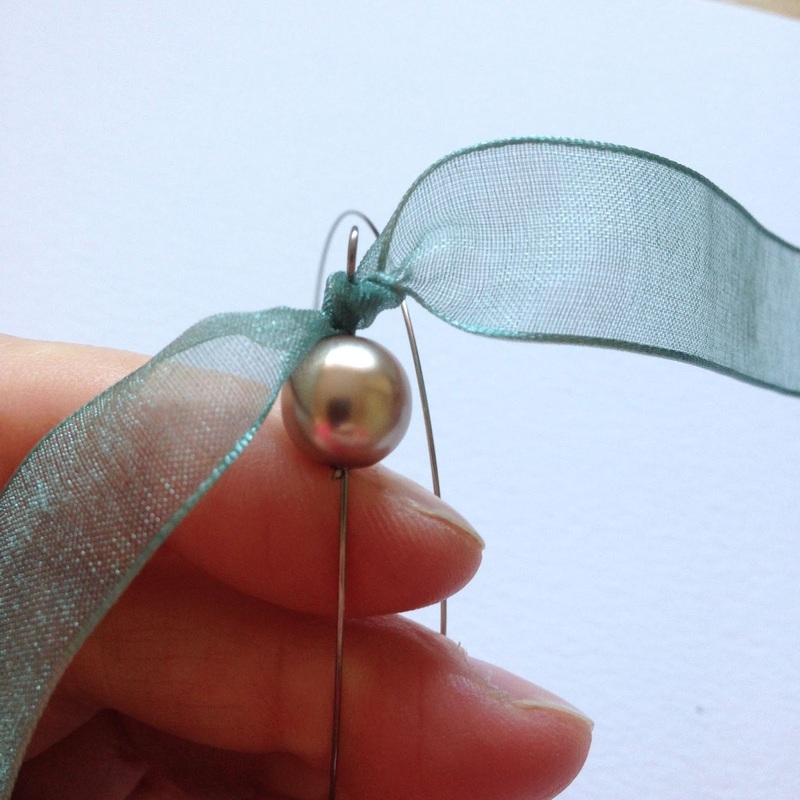 Repeat this process for the second earring to complete the pair. All measurements and quantities are approximate and may vary depending on the materials used. 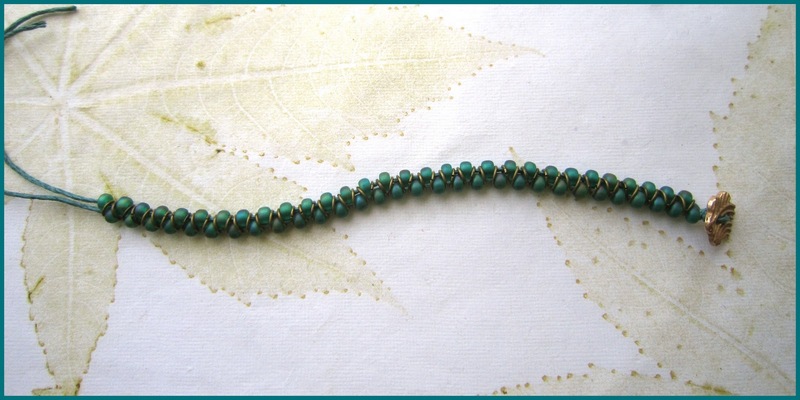 This example is for a bracelet of 7½” with a beaded section of 6¼”. 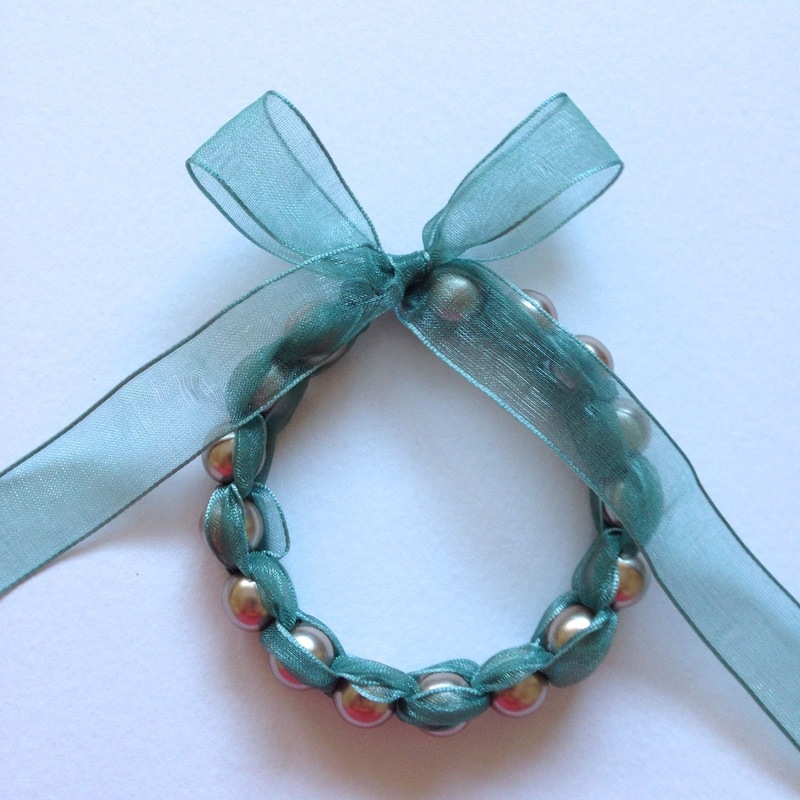 This bracelet can be easily adjusted to fit by adding or removing beads and jump rings. 68 5mm (id) jump rings – to avoid snagging make sure all the jump rings are closed before you start constructing your bracelet. Thread the cord through the button holes and draw it through to create two cords of equal length. Tie an overhand knot close to the button. Thread a bead onto one cord and then thread a jump ring over both cords. Thread a bead onto the second cord and thread a jump ring over both cords. Continue threading beads onto alternate cords interspersed with jump rings threaded over both cords. Continue until the 68 beads are threaded finishing with the last bead on the opposite cord to the first bead. Tie an overhand knot close to the last bead and a second overhand knot to create a loop to fit over your chosen button. 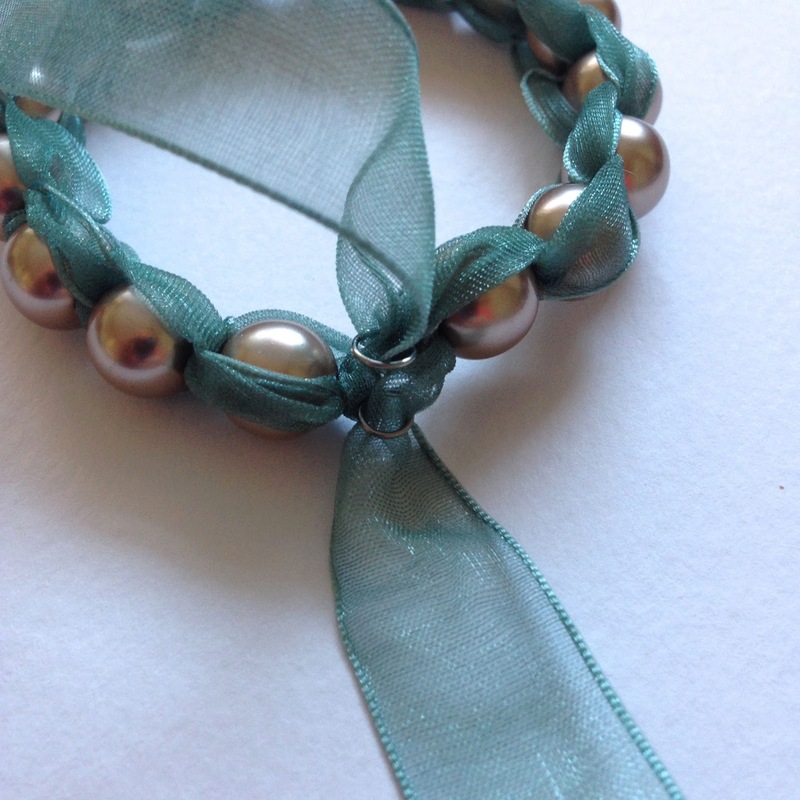 Thread the extra beads onto the tails and knot to secure. Trim any excess cord. 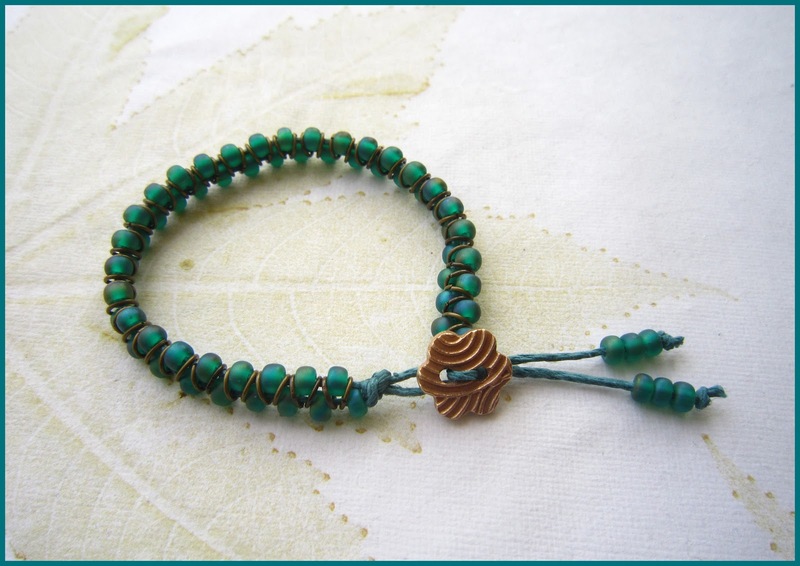 Sit back and admire your finished bracelet! 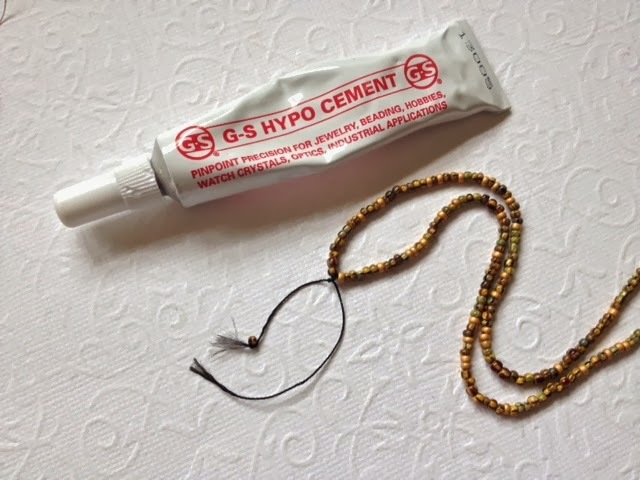 This technique can be adapted for use with necklaces using your preferred attachment technique. On the piece below I used one folded cord attached to the pendant rings with a lark’s head knot and coil crimp ends at the clasp. 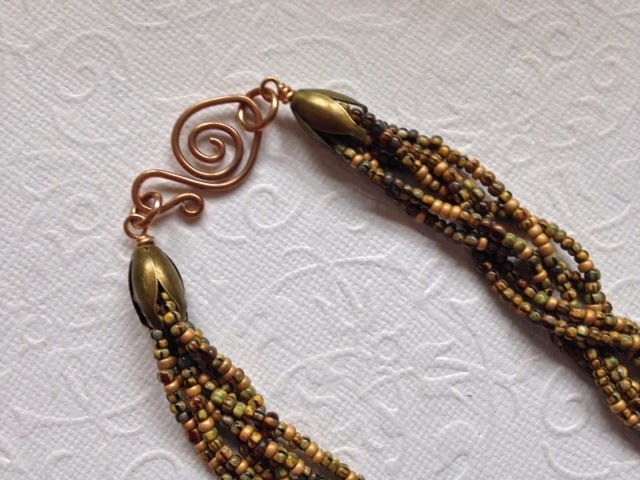 Although I have stipulated bead and ring size sizes the technique can be used with other sizes to give different effects – have fun and experiment! 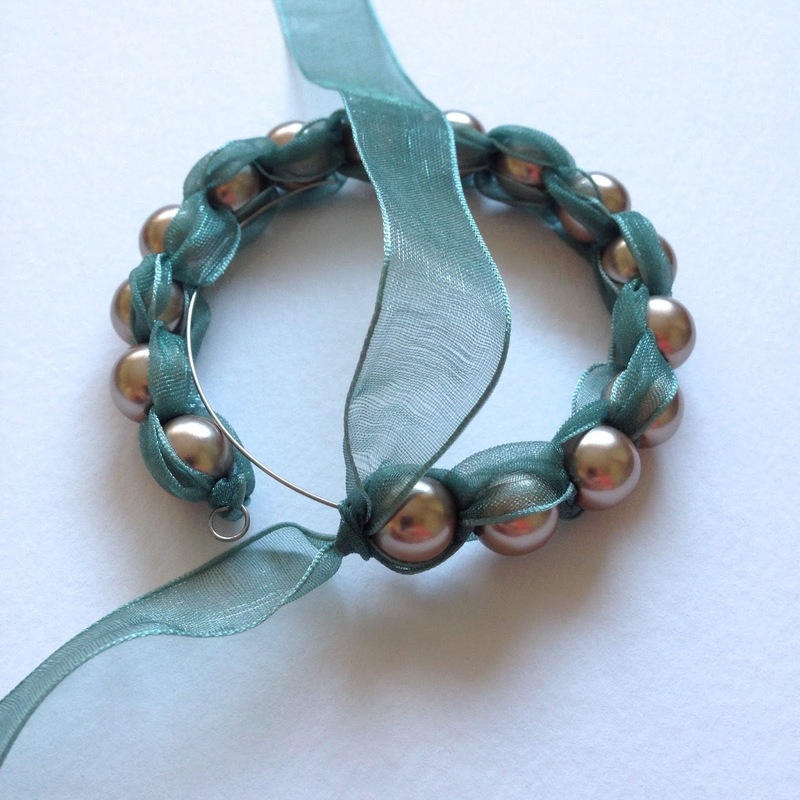 This bracelet is brilliant – and looks so lovely when finished. It is also easy to make and easy on the pocket. I made four of your bracelets over the weekend, and I've ordered beads and jump rings to make more. 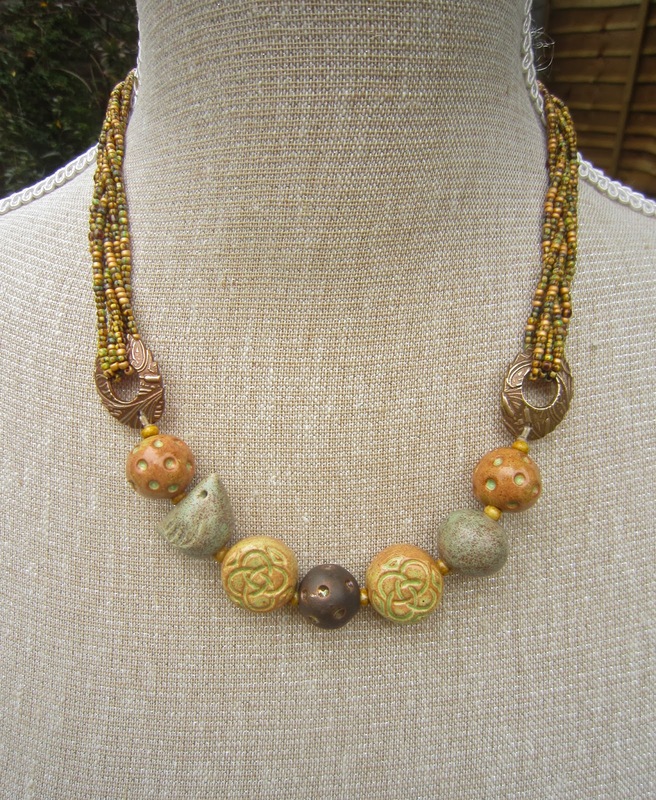 The necklace is also on my 'to make' list , I know there are some nice metal celtic knots in my stash. My daughter has already grabbed one, lets hope hers friends like it so I have a good excuse to make more!!! Hands down BEST tutorial and amazing pattern! 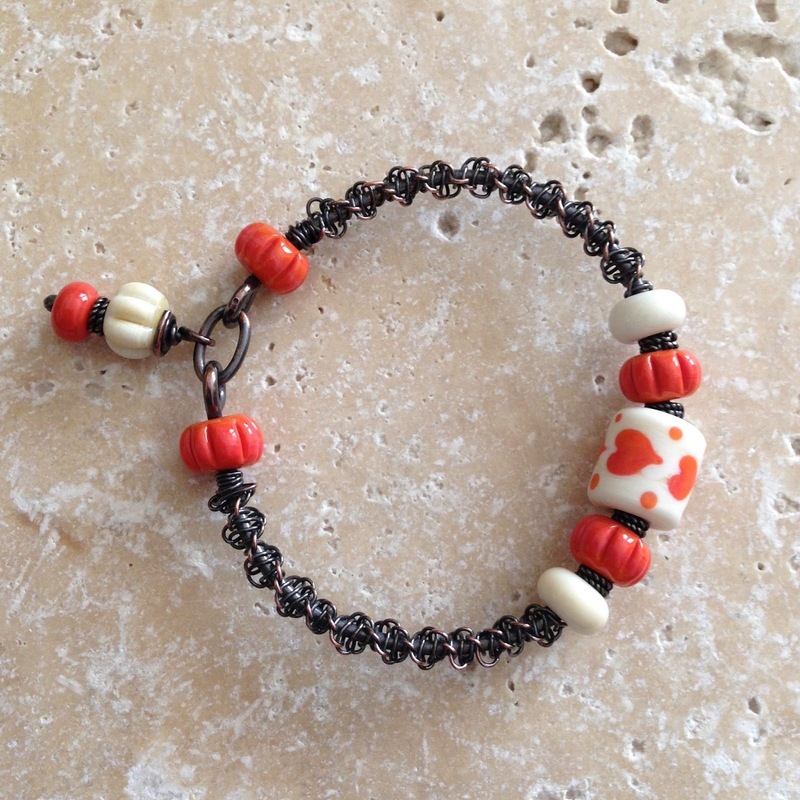 Love this bracelet, Thank you for sharing this with us. 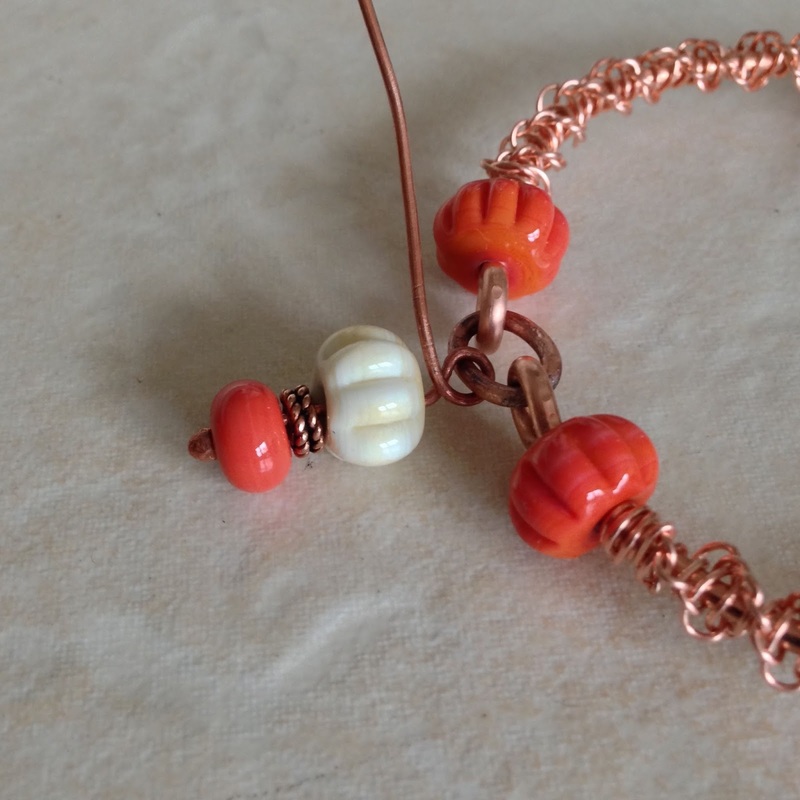 I am going to have a go at making the bracelet. I have just bought some fancy jump closed jump rings so these will be perfect. Thank you. Very nice, thanks for sharing! 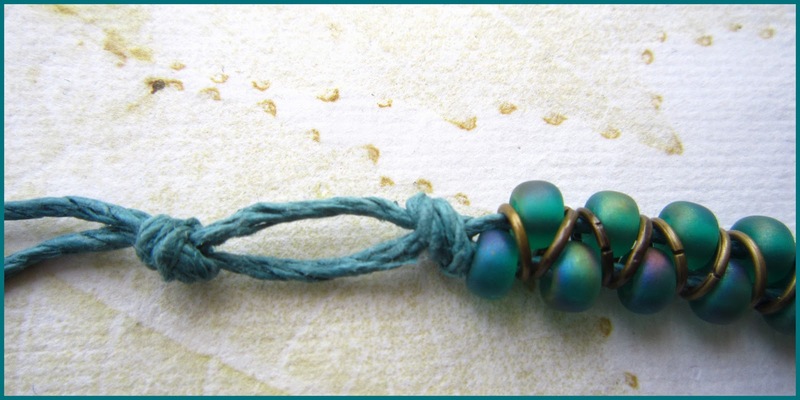 I am gong to do this bracelet! I had never followed a tutorial before because they always seem so hard to understand and im not good at reading and following what it says but your directions were so easy and clear that I made three of these for gifts for coworkers last night and am going to make one for my sister for Christmas!THANK YOU for sharing! Beautiful! I'm curious…what gauge for the jump rings and what size for the buttons (in general)? Thank you! Wow, that is cool! Have to try this! 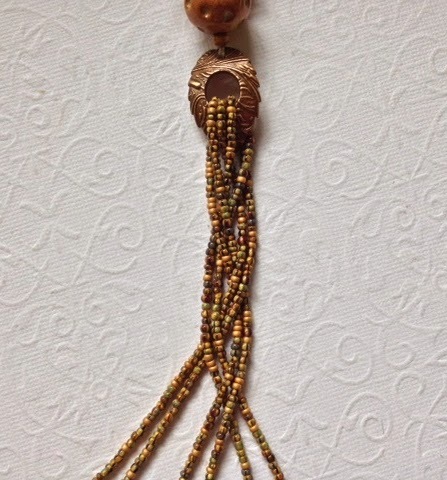 The macrame knotting is amazing, had a look for the knotting wire but can't find any other than on ebay on the search, any tips?? Thank you Lesley for being so generous and also for taking the time to share this fantastic technique. The results look so amazing and yet the technique is quite simple – when you are shown how to do it! Thank you! Really lovely work. Thank you so much for sharing your talent with us. Although I'm fairly new at working with wire, I was well versed in macrame in the early seventies, so that might help me some. Both tutorials are wonderful. I haven't ventured into wire work but those delightful wire macrame earrings might just get me to do it. The jump ring bracelet is so simple but looks just dynamite. Thanks for sharing! Love this and finally made one today!! Instructions very easy to understand and pictures helpful! Thank you for sharing!! What great tutorials really want to try the earrings so all I have to do is get a vice. Wow It's lovely! Sure I will try to do it very soon! Thanks for sharing! Love both these projects! I can't wait to try them! Thanks so much for sharing! Great tutorial.I tried knitting with wire but doing macrame will be great too. Give it a try soon. Thanks for sharing. 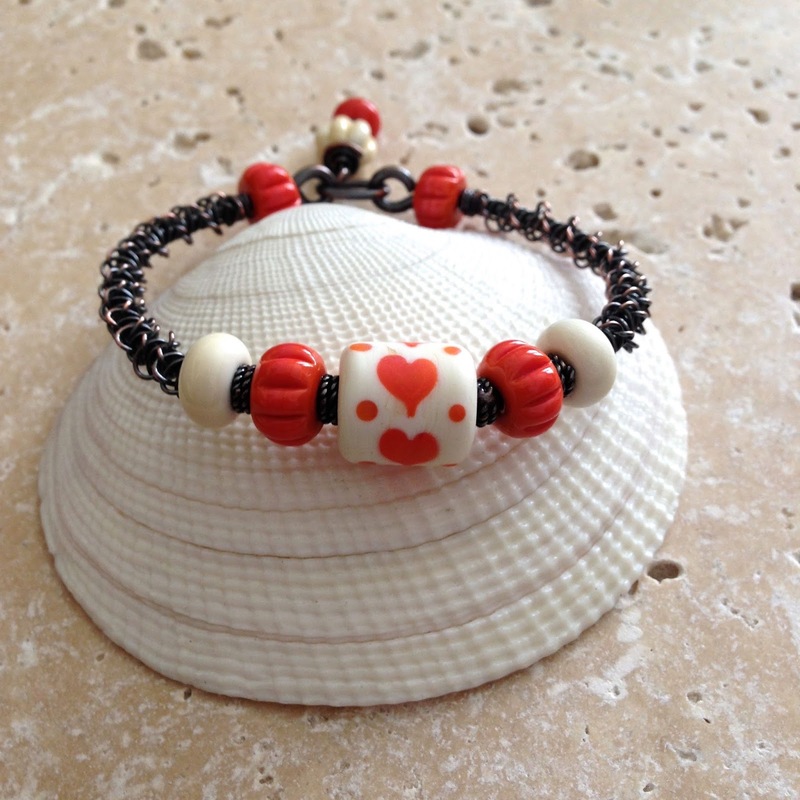 I love the seed bead and jump ring bracelet. Thank you so much for your generosity. I definitely want to try this with all kinds of beads. Muy bonito gracias por tu explicación. Besos. soooo amazing …thank you for the tutorial! Love the necklace and bracelet. 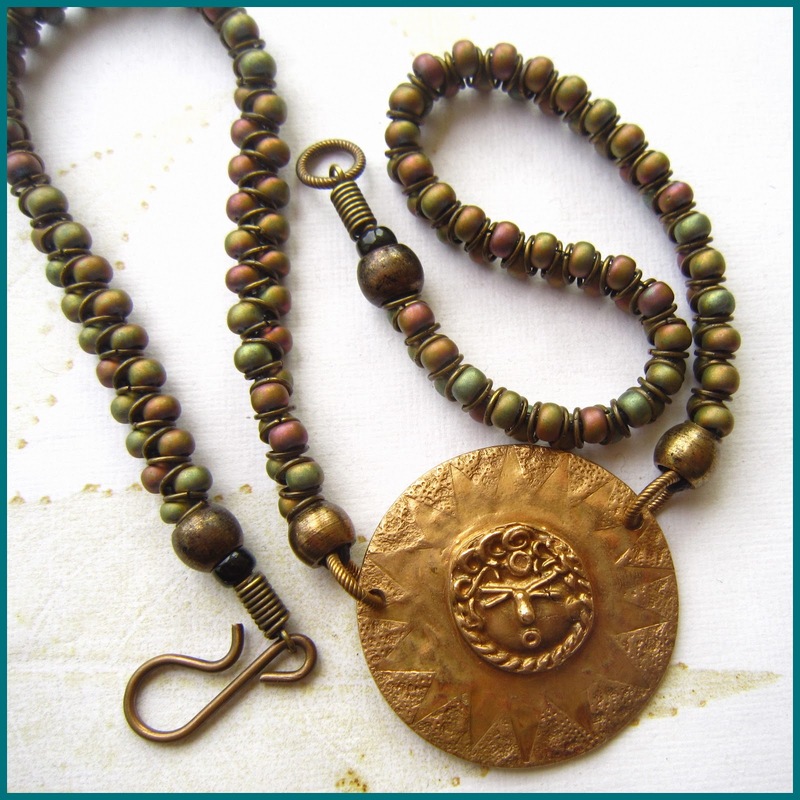 What size beads and jump rings did you use for the necklace with the pendant? Awesome. Love this… Thank you so much for sharing!! Just found your tutorials here – wow, what fantastic ideas! Thank you so much for sharing! I've tried to find the color beads you use on the JumpRing/SeedBead necklace, but none of my local bead shops carry it it. Any chance you could give me the name of the mix you used? HI Victoria – the beds in the necklace are: Myuki type 5-409FR Size 5 Matte opaque chocolate AB. Thank you do much for your fabulous tutorials. Someone had posted a picture in Pinterest so figured it out for a 3-wrap. Took a LOT of jump rings! Made it with lavender AB 6°s and ant. silver jump rings and button!! Total hit and feels so nivmce wearing it!